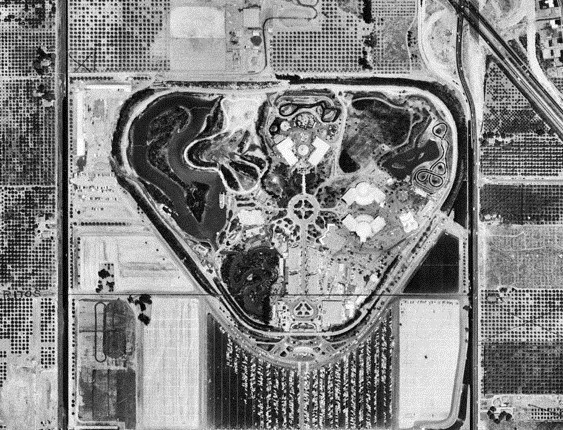 (1958)* - Aerial view showing Pacific Ocean Park amusement park, which opened in 1958. (1958)##** - Postcard view showing the entrance to Pacific Ocean Park. Click HERE to see early POP promotional video. (ca. 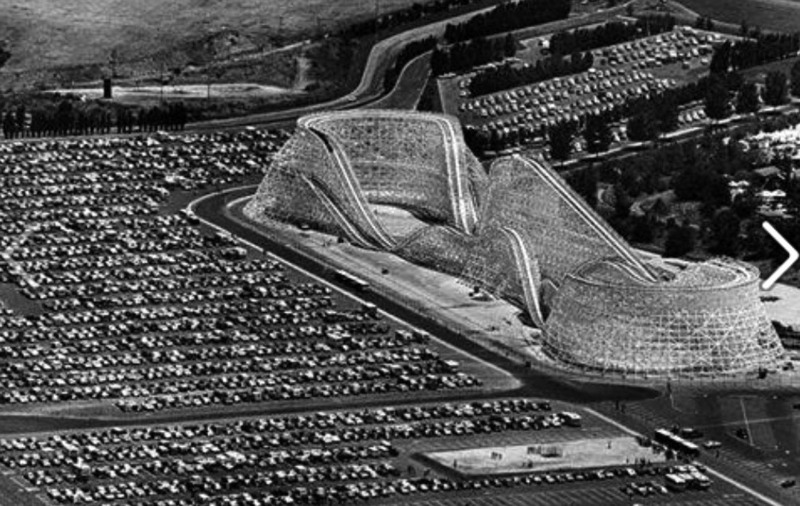 1958)* - View of the Sea Serpent Roller Coaster and a concession stand which resembles a wrapped jug. Park visitors drive miniature cars along the Union 76 Ocean Highway causeway on the edge of the park. 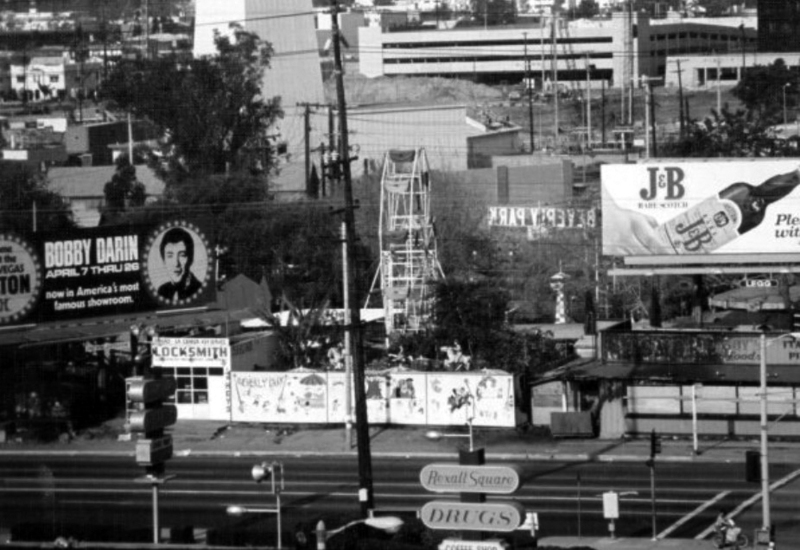 The jug-like stand in the center of photo was called "Pepe's Pizza". It was originally a prop from the movie "Pepe" starring Cantiflas as seen in this clip: https://www.youtube.com/embed/tRiGIY7MGSY. It was also seen in an episode of "The Donna Reed Show" as Donna Reed has a cameo in the film. 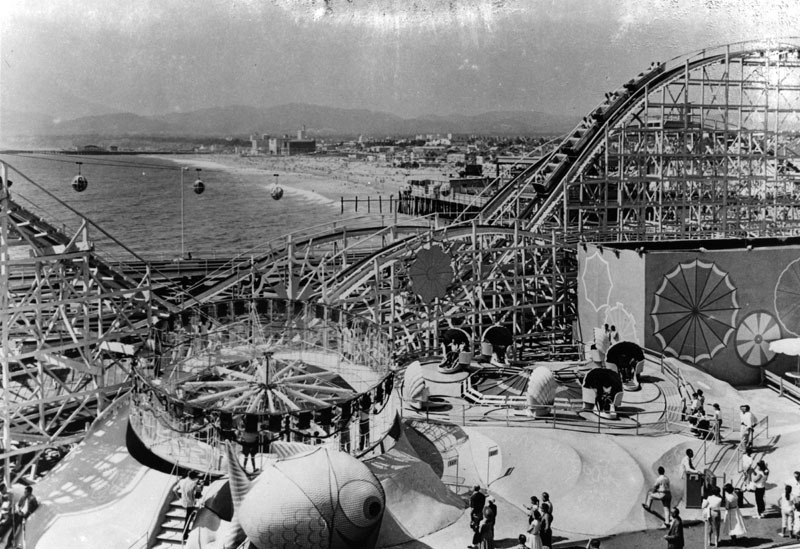 (1958)* - View of the pier and all of the amusements found at Pacific Ocean Park in Santa Monica. Photograph dated July 18, 1958. (ca. 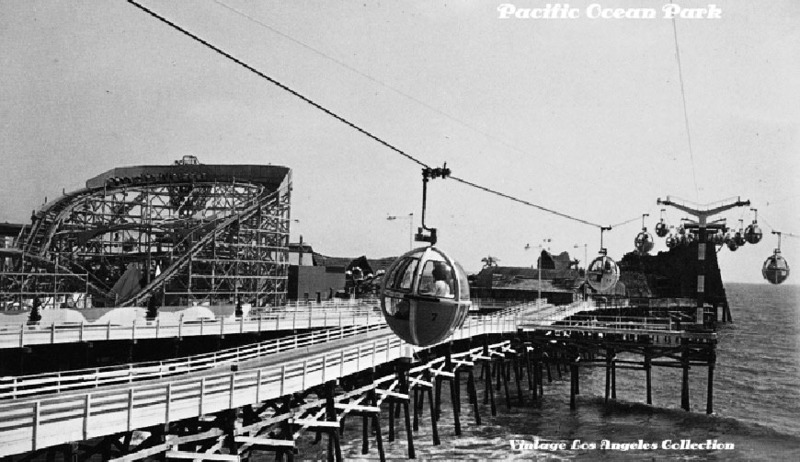 1958)* - Several rides and a view of the beach at Pacific Ocean Park. 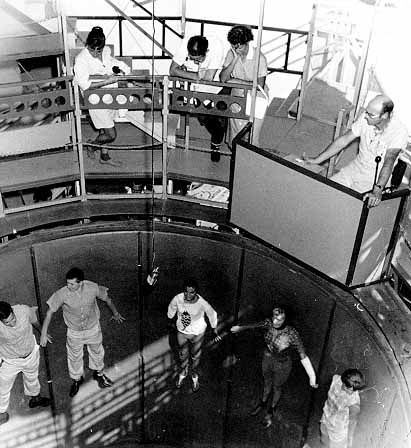 The Whirl Pool was the classic rotor ride where a centrifuge pinned riders to the spinning walls as the floor dropped beneath them. 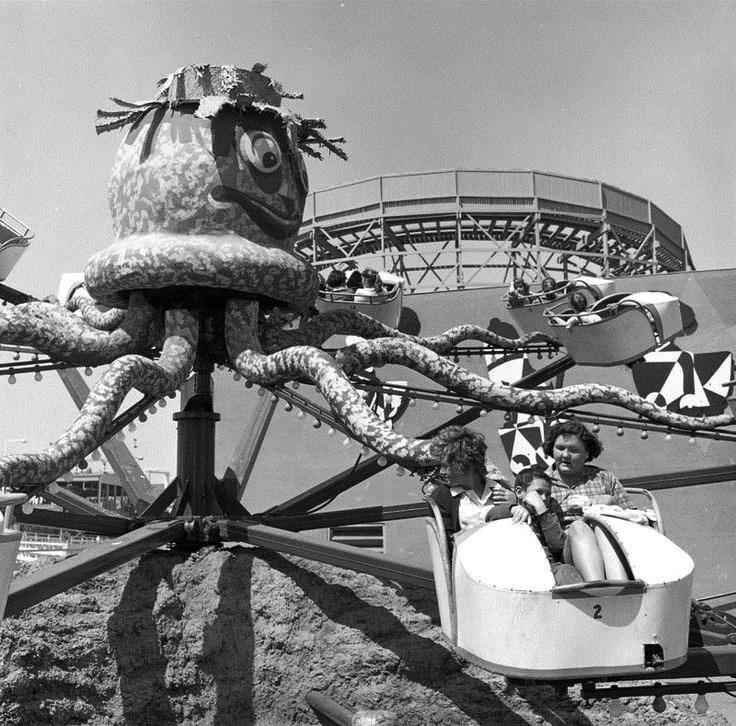 (1961)* – View showing the Octopus Ride at Pacific Ocean Park, Santa Monica. 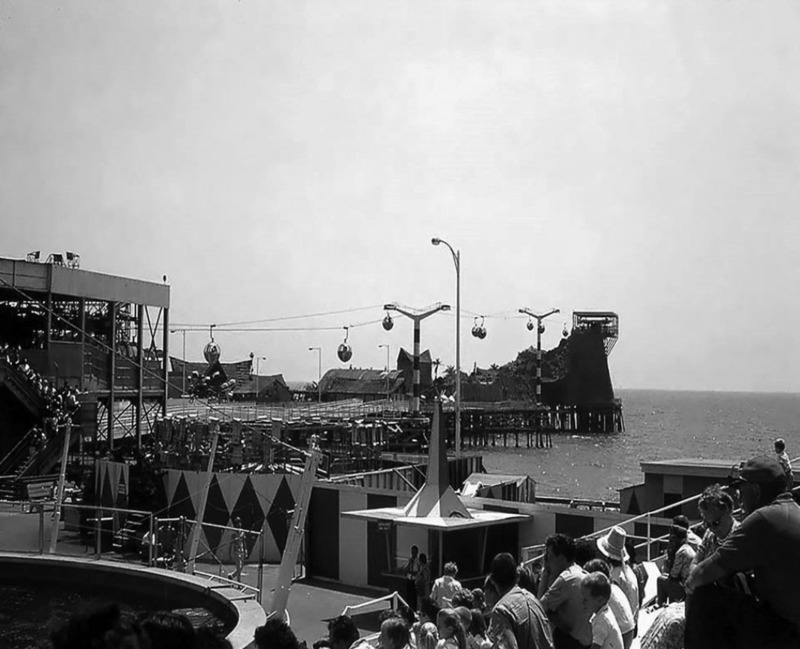 (1961)* - People are seen waiting in line to get on the Flying Dutchman Ride. (ca. 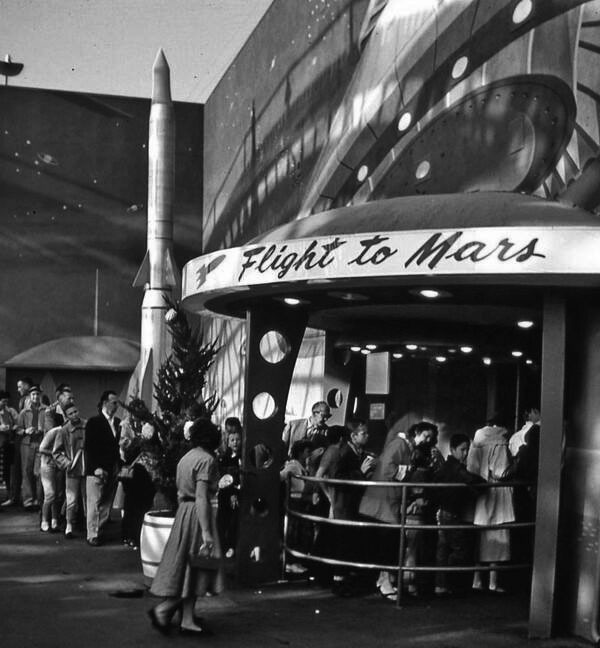 1960s)*^*# – View showing the line in front of the "FLIGHT TO MARS" ride at Pacific Ocean Park. The Flight to Mars attraction was a unique trip to the red planet that offered guests to blast off and walk around the surface of the red planet. (ca. 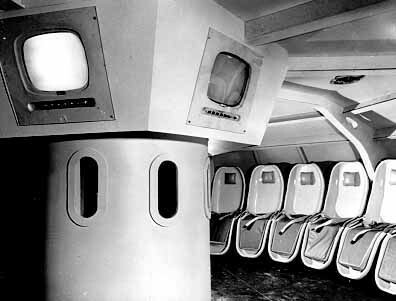 1958)** - The rocket flight to Mars was in a space theater with TV screens showing the flight's progress. When the space ship reached Mars, visitors could tour a Martian home and see the Martian creatures. (1960s)##** – View showing South Sea Island and the Mystery Island Banana Train Ride. (1960s)#^*^ - View showing spectators at The Sea Circus. 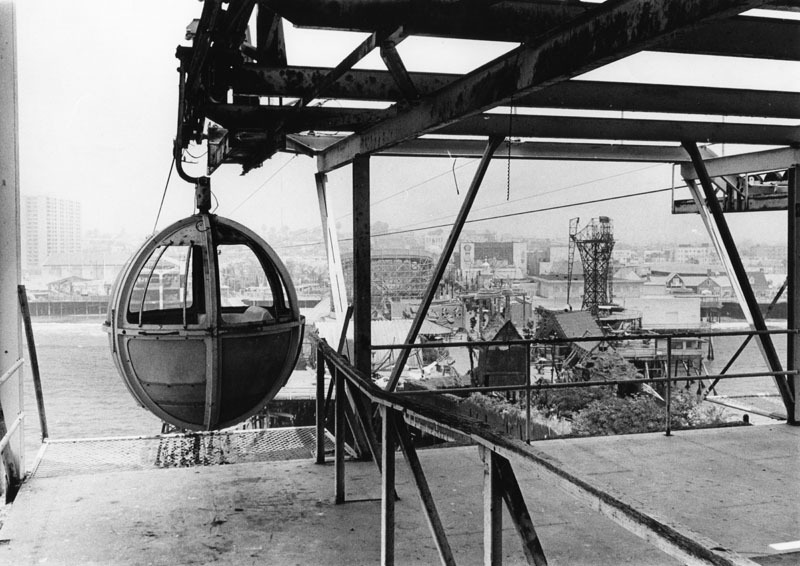 The Ocean Sky Ride with its bubble gondolas can be seen in the background. (ca. 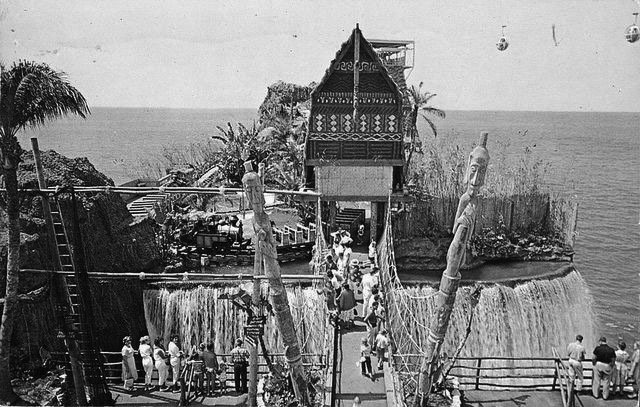 1958)^* - The Ocean Sky ride carried passengers out to the end of Mystery Island and back for a sightseeing tour only. 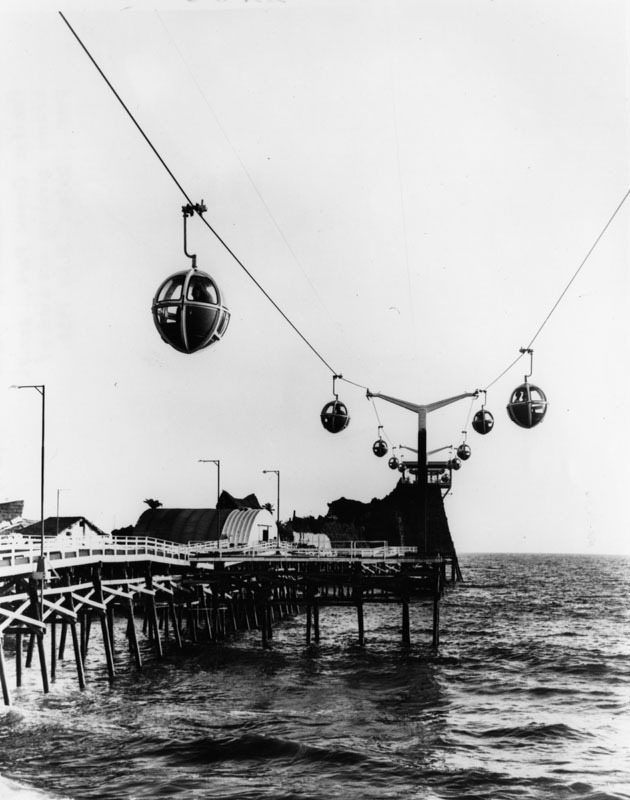 (1958)* - Aerial tram skyride circling one side of the pier at Pacific Ocean Park, July 19, 1958. 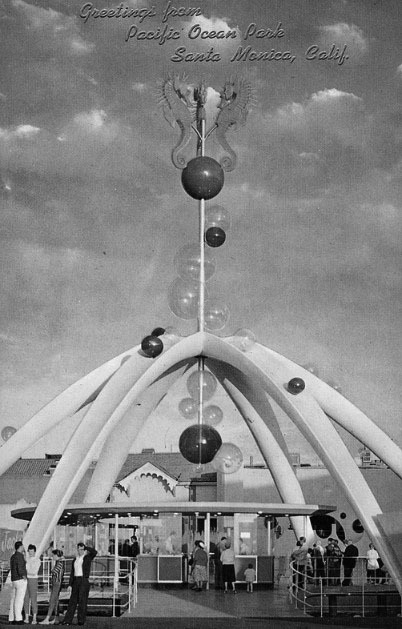 (1968)* - View of a vacant Pacific Ocean Park and the "Ocean Skyway" bubble after the park went bankrupt. 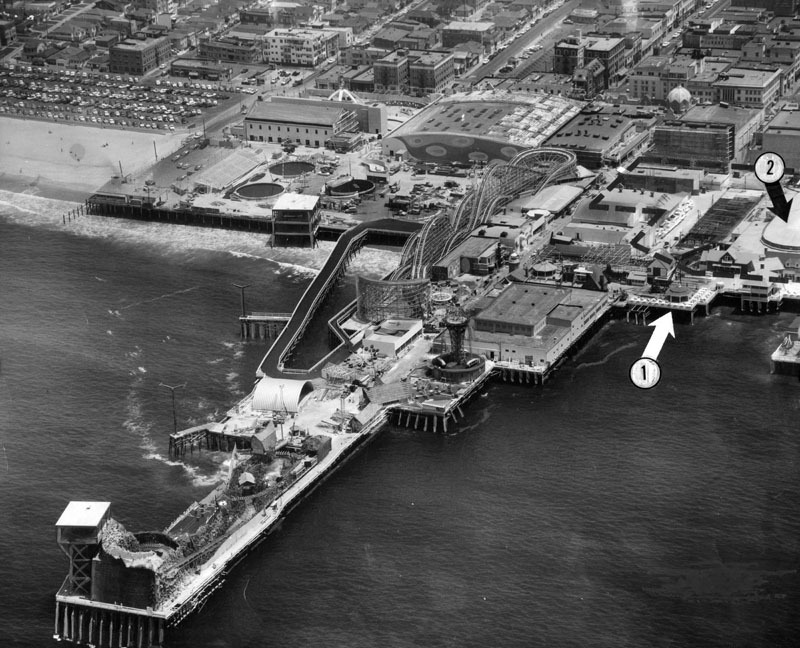 (1972)*x* – View of the entrance to an abandoned Pacific Ocean Park 5 years after the park was officially closed. 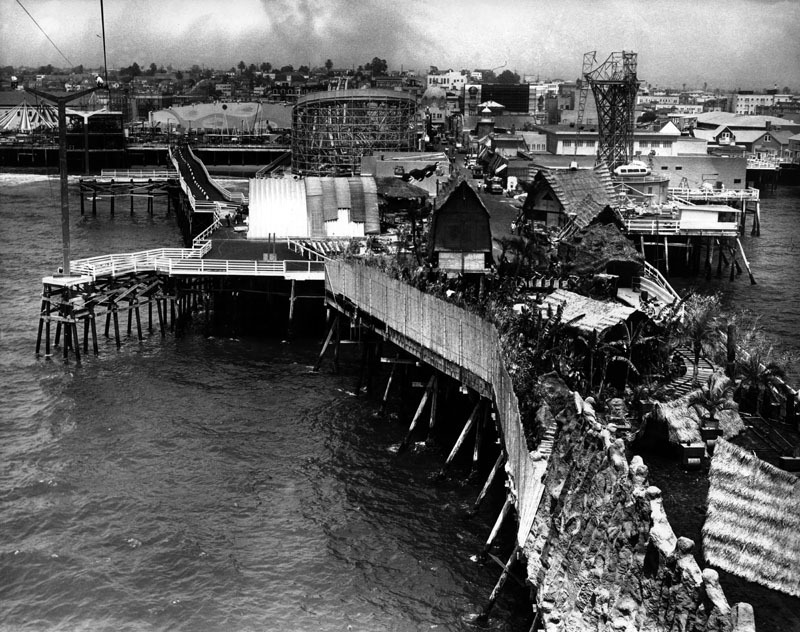 (1973)* - Fire rages unchecked at Pacific Ocean Park's outer pier. Hundreds of spectators lined up on the beach and watched the 50 yr. old pier go up in smoke. Photograph dated March 17, 1973. 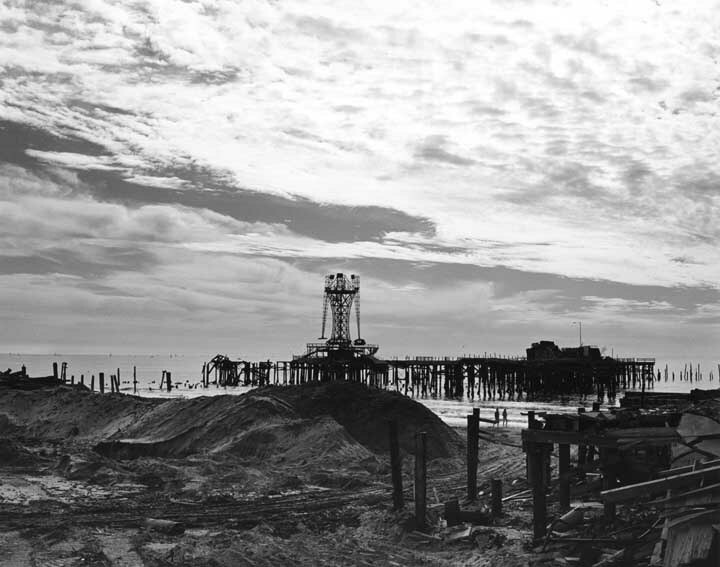 (1975)^^^ - Demolition of Pacific Ocean Park. 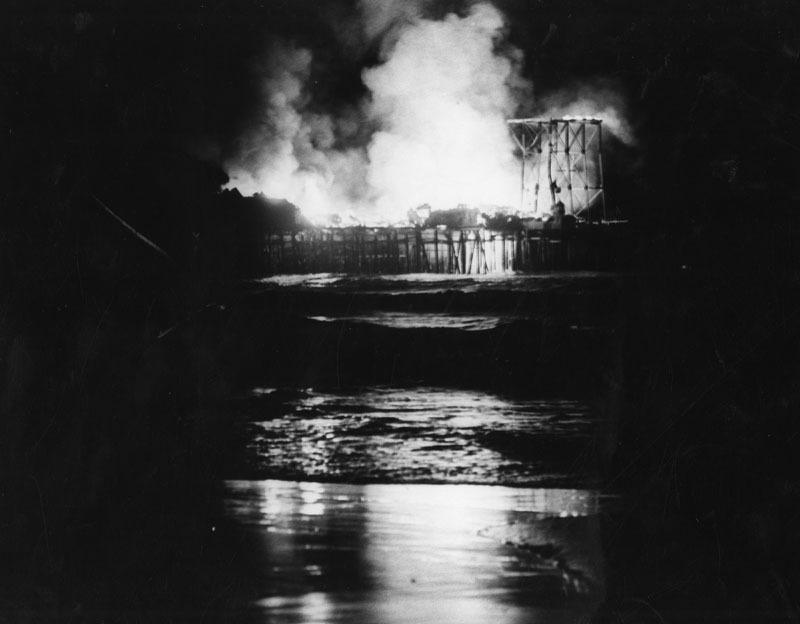 The park's dilapidated buildings and pier structure remained until several suspicious fires occurred. The final demolition took place in the winter of 1974-75. Most everything was removed but people's fond memories. 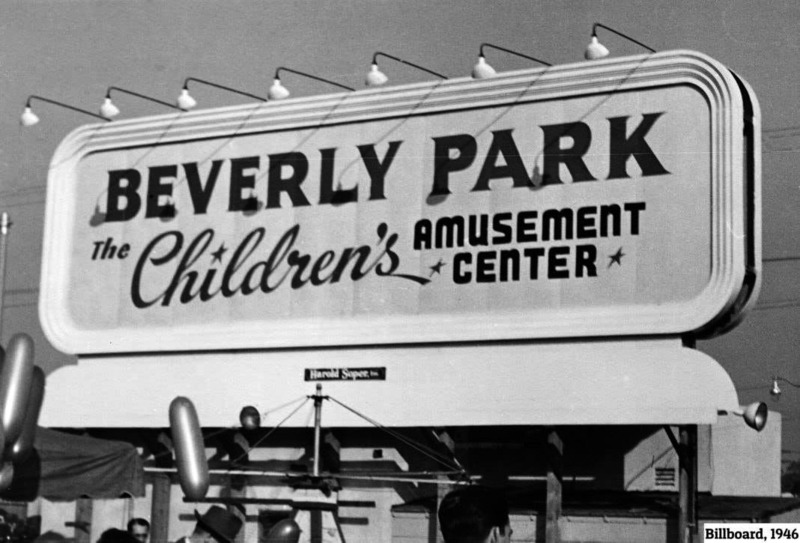 (1946)^*^ - Large signoboard near the corner of Beverly and La Cienega Boulevards: BEVERY PARK - The Children's AMUSEMENT PARK. 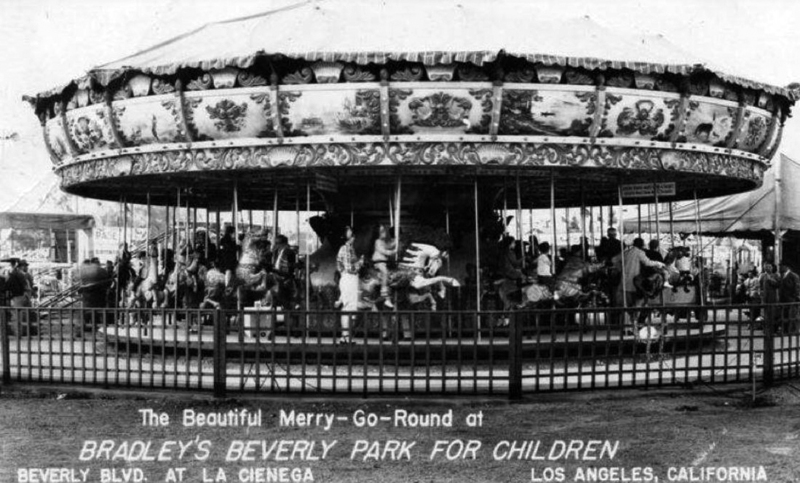 (1947)^## - Postcard view showing a Merry-Go-Round at Beverly Park, also known as Kiddieland. (1970)#*#* - A typical Saturday at Beverly Park. 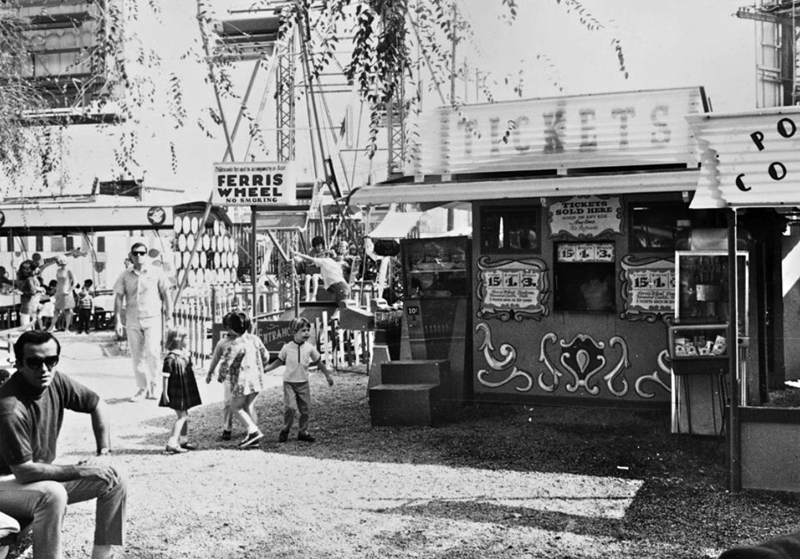 Fathers watch as kids run in excitement near the ticket booth with Ferris wheel in he background. (ca. 1970s)#*#* - Spending the afternoon at Beverly Park with one's grandparents was always a special time. 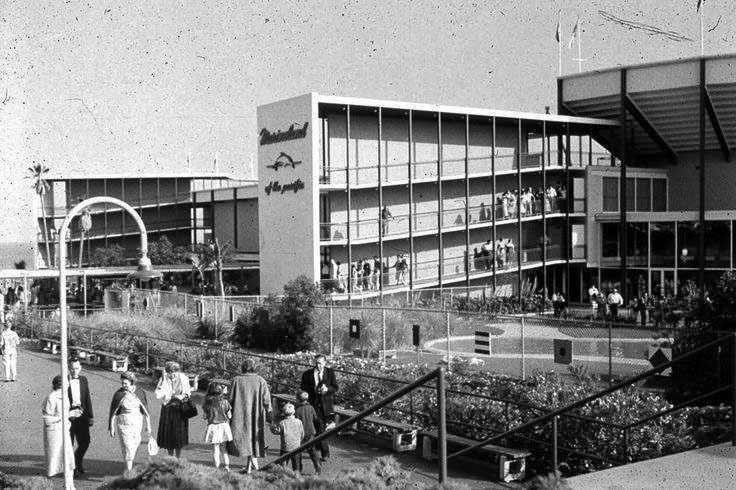 Kiddieland was a whimsical amusement park located on less than an acre on the corner of La Cienega and Beverly Boulevard, at the present home of the Beverly Center Mall. Originally, the land parcel was part of an oil field, which was leased for development. (n.d.)#*#* – View showing the area reserved for Birthday Parties at Beverly Park/Kiddieland. 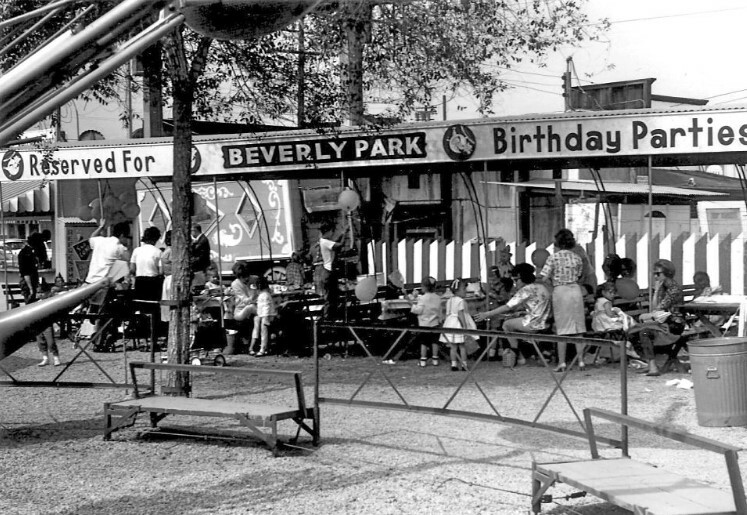 Beverly Park was a perfect place to have a Birthday Party. It had a picinic area set aside for such occasions. But most important, it had enough fun rides to keep the kids busy for hours. 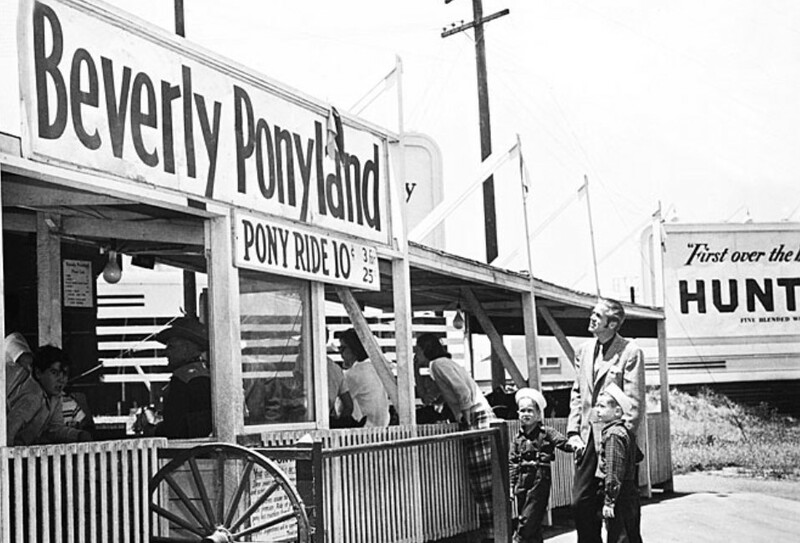 They could even top off the day with pony rides at Ponyland, which was located just west of Kiddieland on Beverly Blvd. (ca. 1947)#*#* - A man and two boys with sailor hats stand in front of the Pony Rides at Beverly Park Poneyland, adjacent to Kiddieland. 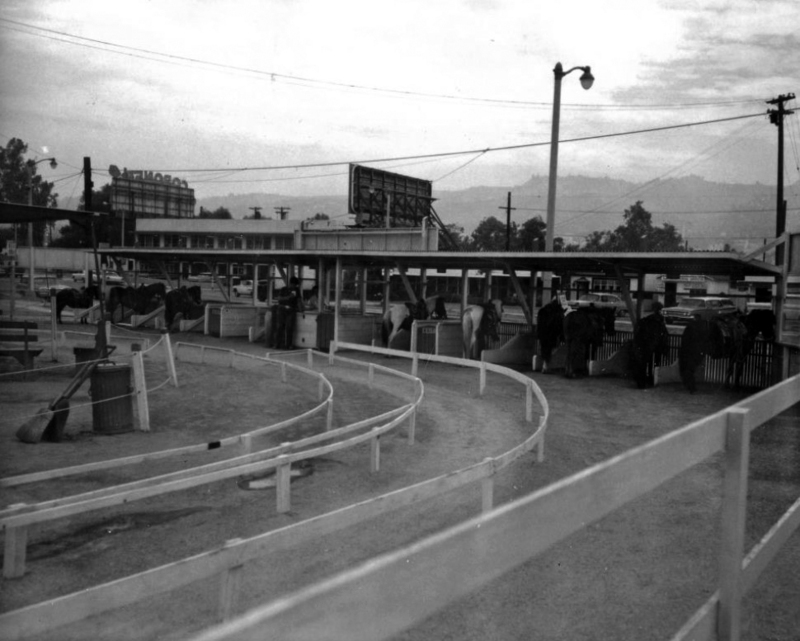 (Early 1970s)#*#* - Looking northwest showing the three tracks (L to R: slow, medium, and fast) at Beverly Ponyland with ponys in the background ready to be mounted. 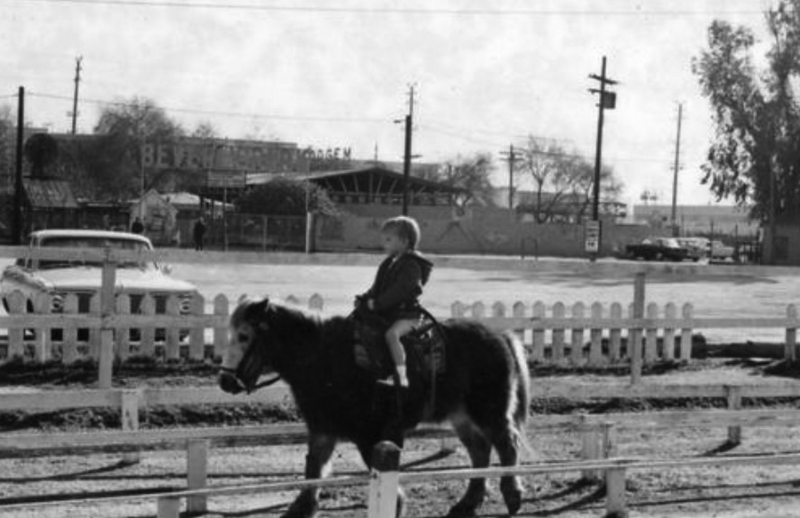 (Early 1970s)^##* - A young boy riding a pony in the inside track (possibly his first pony ride). 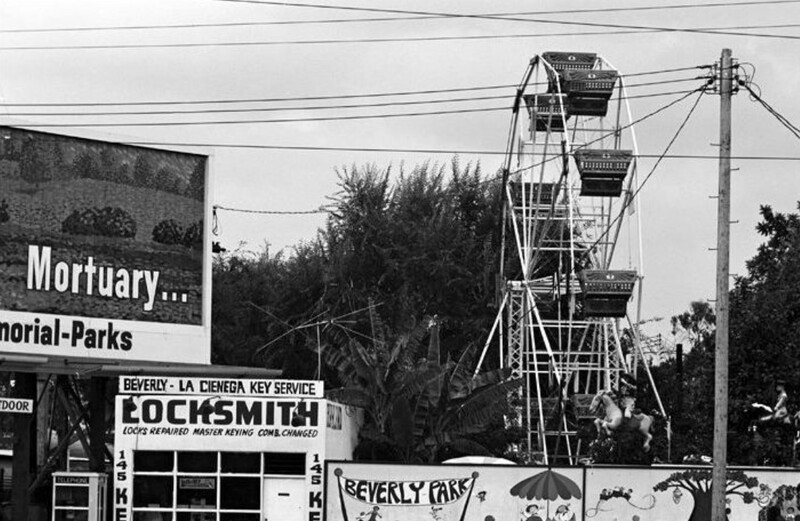 (1972)^## – Close-up view showing Beverly Park and Ferris wheel, with Locksmith on left. 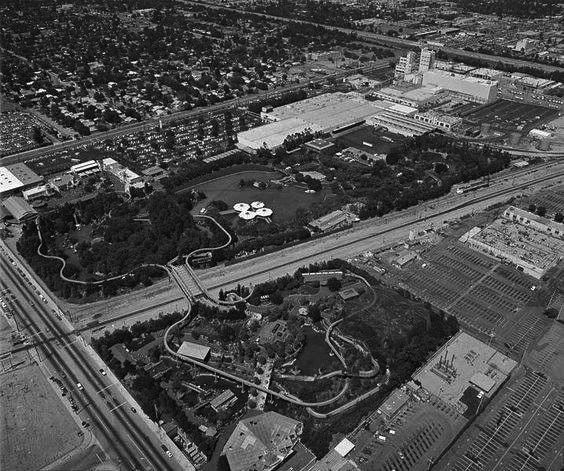 (1970)^## – Bird's-eye view showing Beverly Park at the corner of La Cienega and Beverly boulevards looking West. 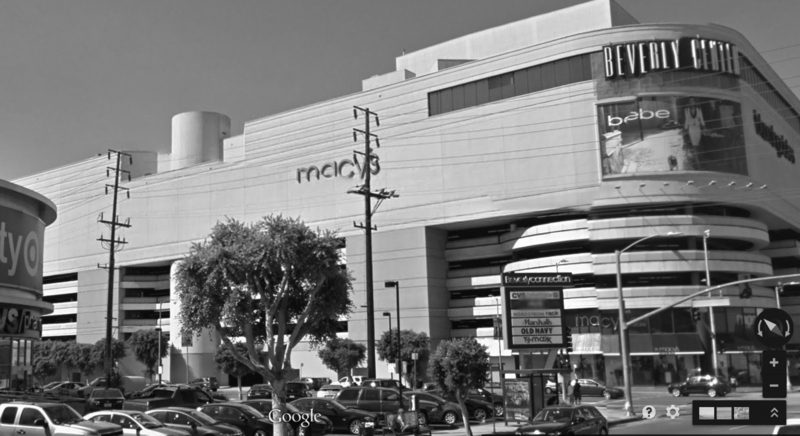 The Beverly Center is in this location now. Rexall is now a CVS. Smokey Joes cafe on the bottom right had just suffered a fire. Note the enclosed oil well at upper-left. The western portion of the Beverly Center contains a cluster of oil wells in a drilling enclosure that is active to this date. (2014)^^^# – Google street view showing the southwest corner of Beverly and La Cienega where Beverly Park once stood. 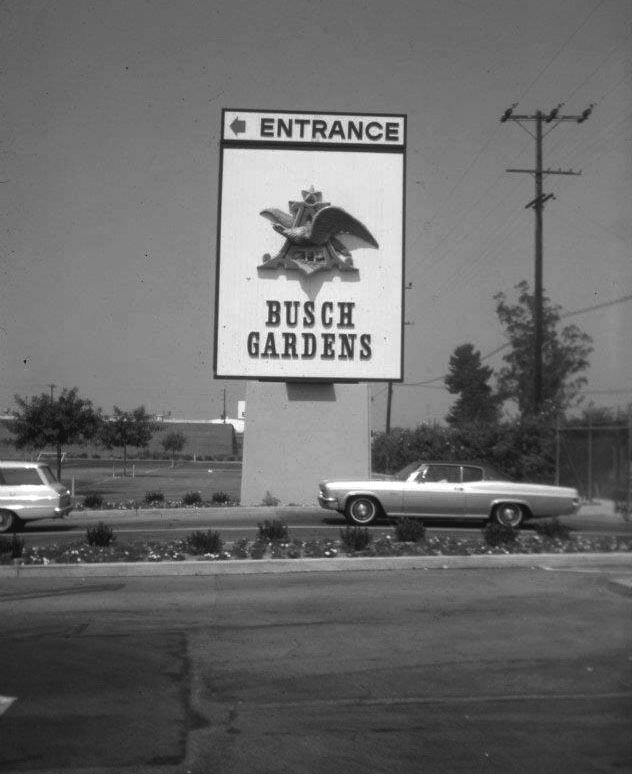 (1970)^## - Southwest corner of Beverly and La Cienega. (2014)^^^# - Southwest corner of Beverly and La Cienega. 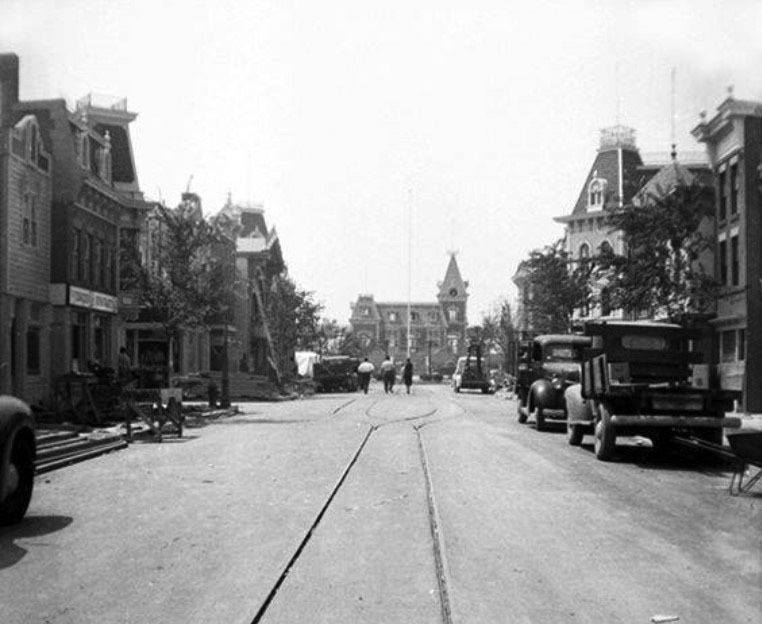 (1954)*^*# – Disneyland Main Street under construction. 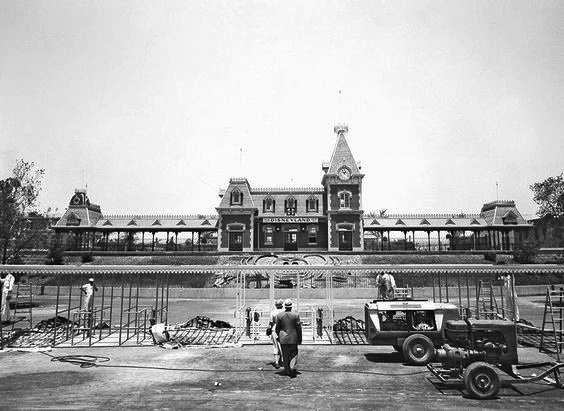 (1954)^.^ - View showing the Disneyland front gates under construction. (1955)^.^ – Aerial view look down Main Street showing Disneyland taking form. 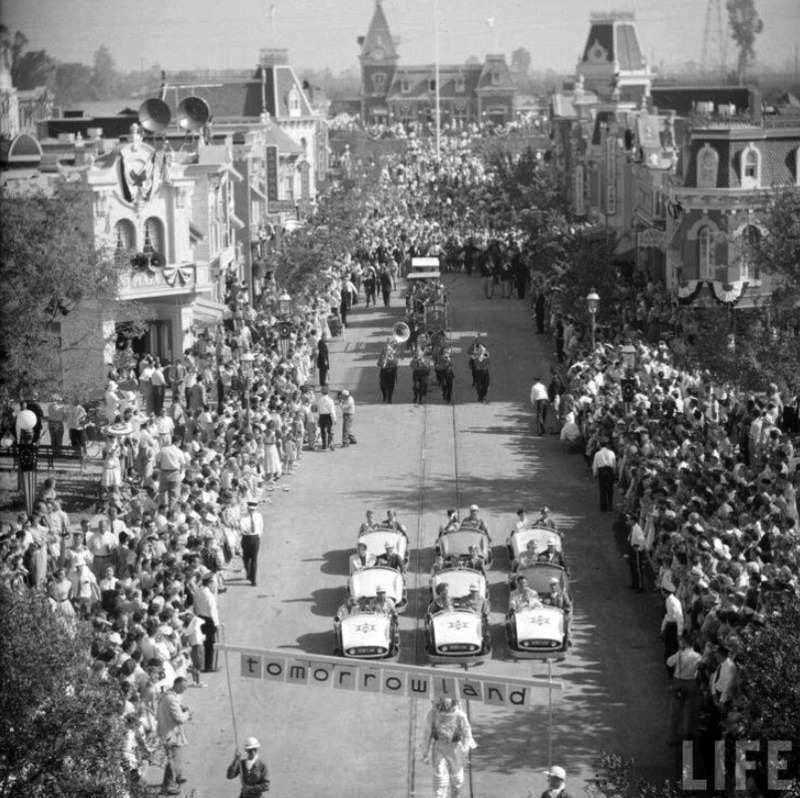 (1955)*^# - Disneyland on opening day, July 17, 1955. View is looking north, with Harbor Boulevard on the upper right and the Santa Anna Freeway running across the top. Visitors show up early on the 1st Day. 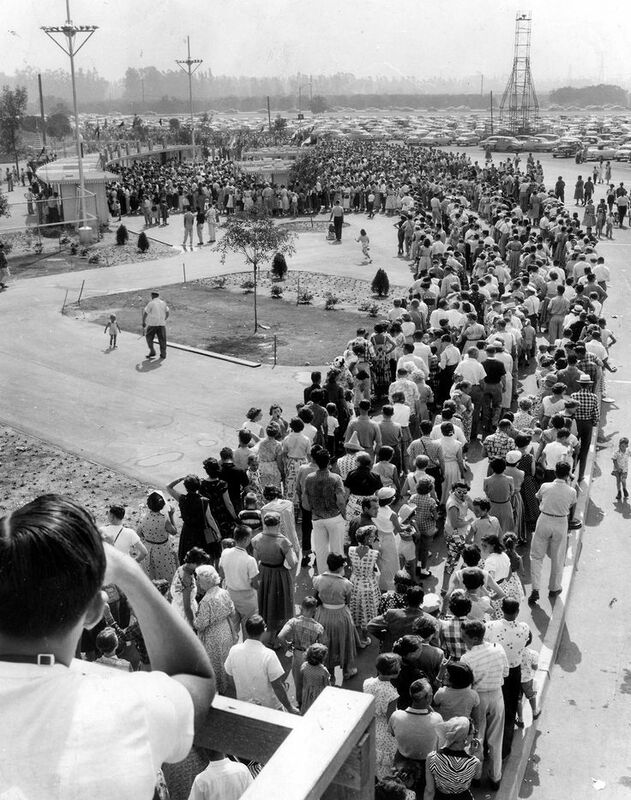 (1955)^**^ - The line to purchase Disneyland tickets on the park's opening day. 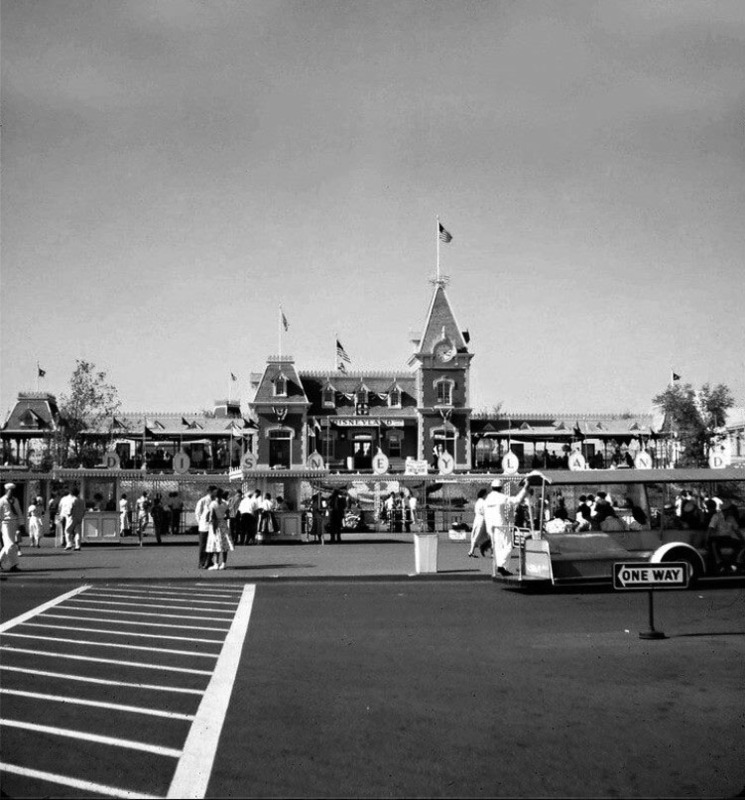 Disneyland opened its gates at 2:30PM on Sunday July 17, 1955. 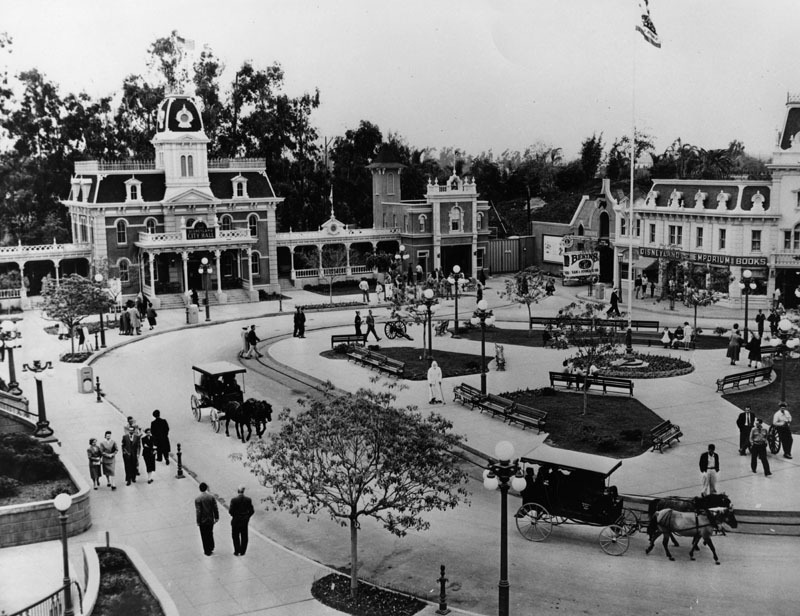 The park opened as invitation only on this day, given to studio workers, construction workers, the press and officials of company sponsors. (The park opened to the general public the following day - July 18.) Because tickets to the grand opening were counterfeited, a surprising 28,000-plus attended. Actor Fess Parker, famously known in 1955 as TV's Davy Crockett, led the opening-day parade dressed as the famous frontiersman and riding a horse. The Mouseketeers were first introduced to the public during the live broadcast of the Disneyland opening day festivities. All 24 members were featured in the inaugural Main Street parade and were showcased with their very own musical production number. 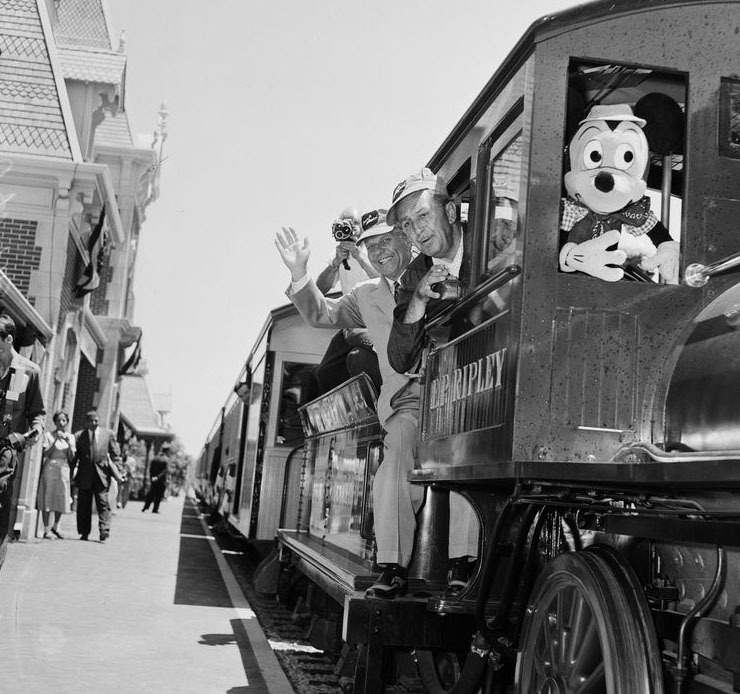 (1955)^^ - Opening day at Disneyland - July 17, 1955. 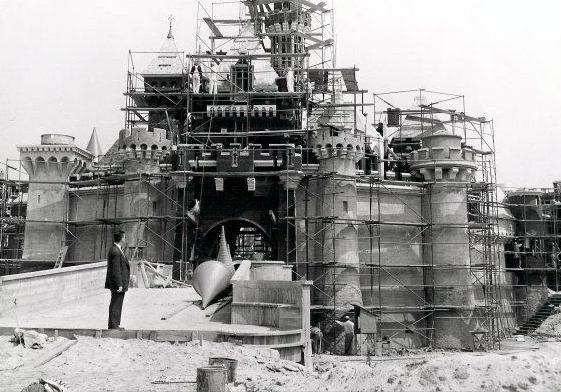 Walt Disney is there to see his dream come to life. 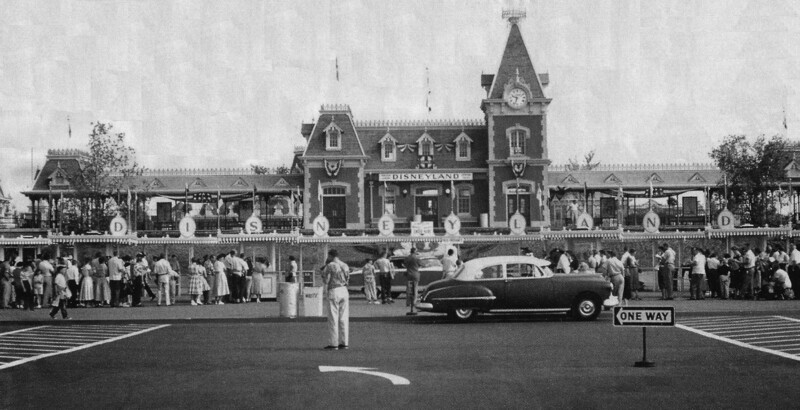 (1955)++# – View showing the entrance to Disneyland, Anaheim, the year it opened with early model car parked in front. (ca. 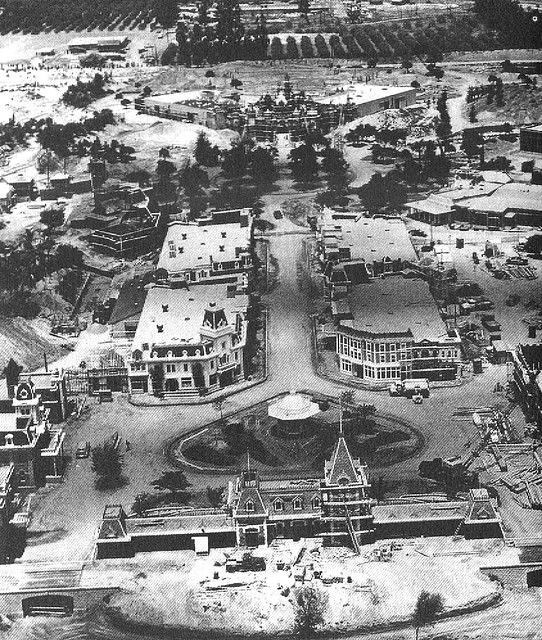 1956)* - View of Disneyland's Town Square, facing City Hall. 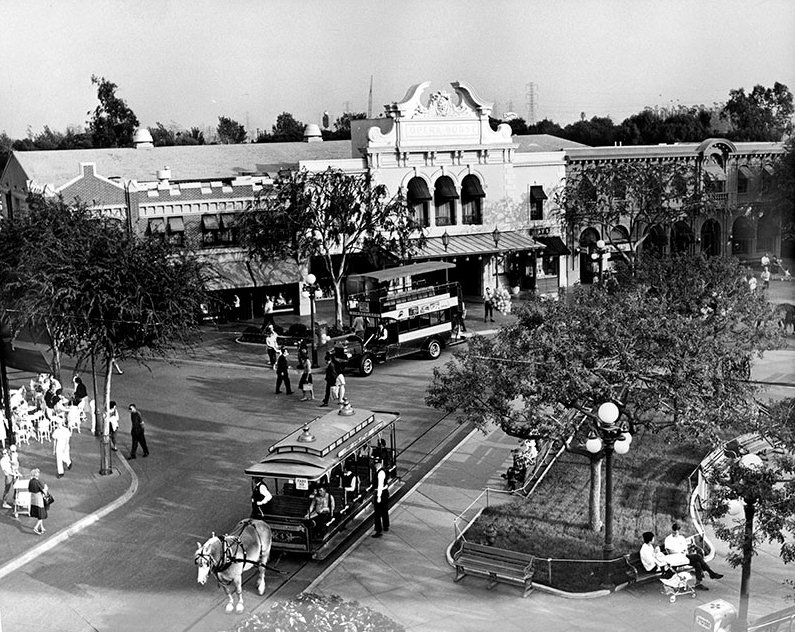 This is part of "Main St., U.S.A." Two horse-drawn carriages are seen on the street. 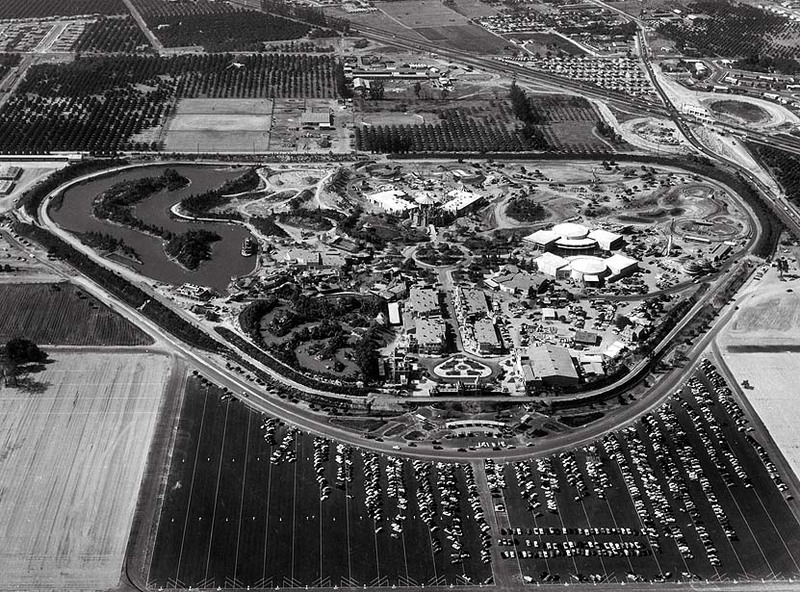 (1956)* - Aerial view of Disneyland amusement park and surrounding neighborhoods in Anaheim; view is looking east. Several orange orchards are visible beyond the park, but the area in the forefront is still undeveloped. 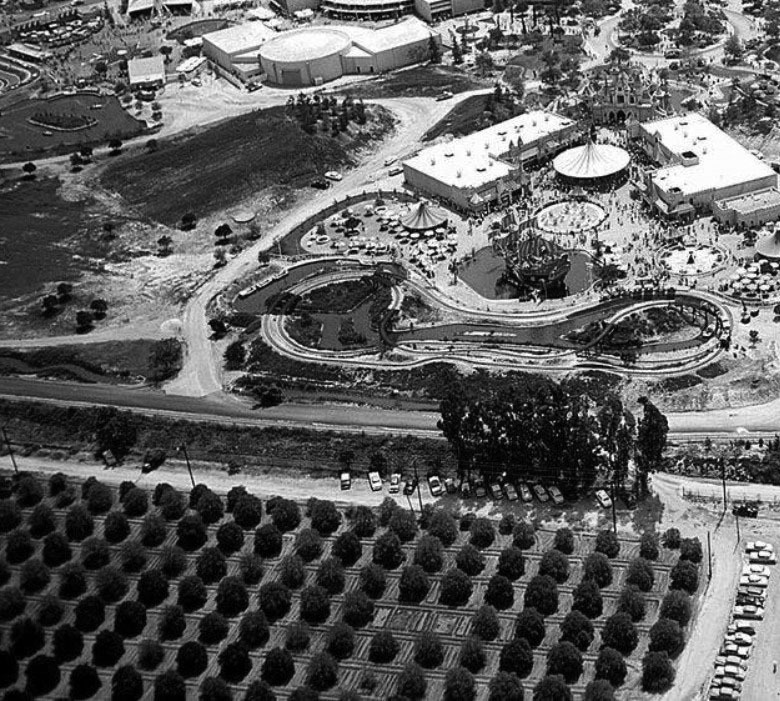 (1955)*^*# – Closer view of Disneyland showing an orange grove next to the park. 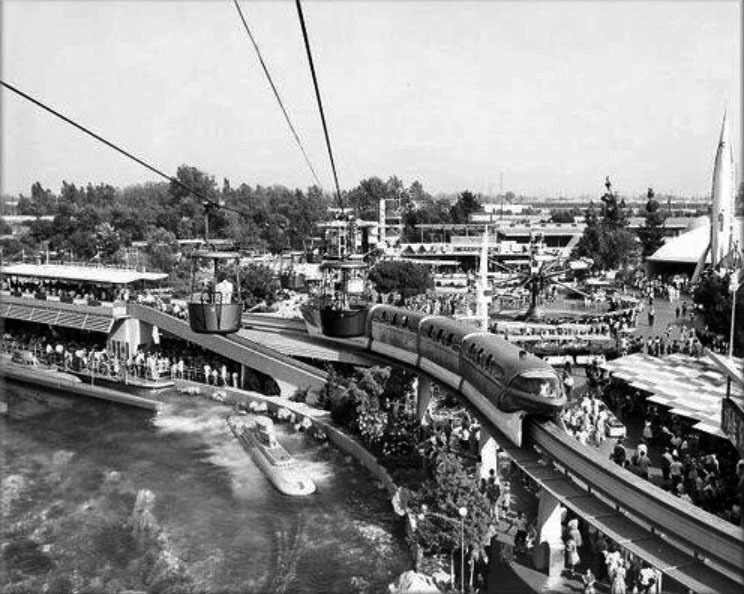 (1957)* - The past catches up with the present at Disneyland as the 1900 freight train pulls abreast of the Tomorrowland Viewliner. 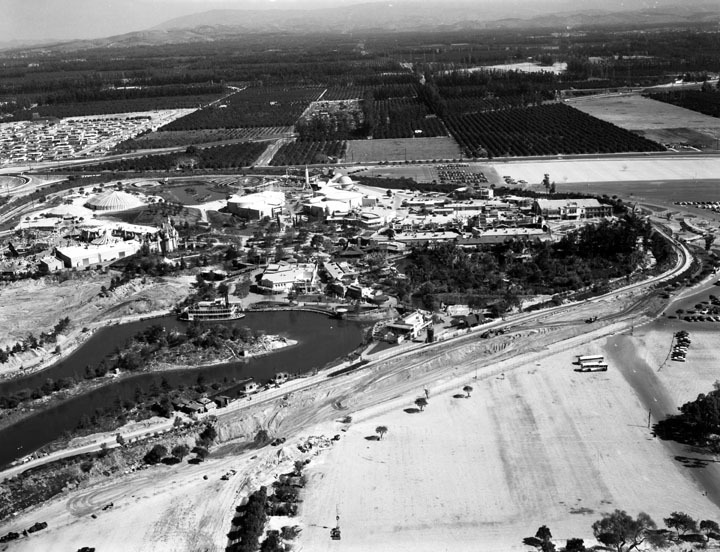 (1955)*# - Aerial view of Disneyland surrounded by orange groves and also by a train. 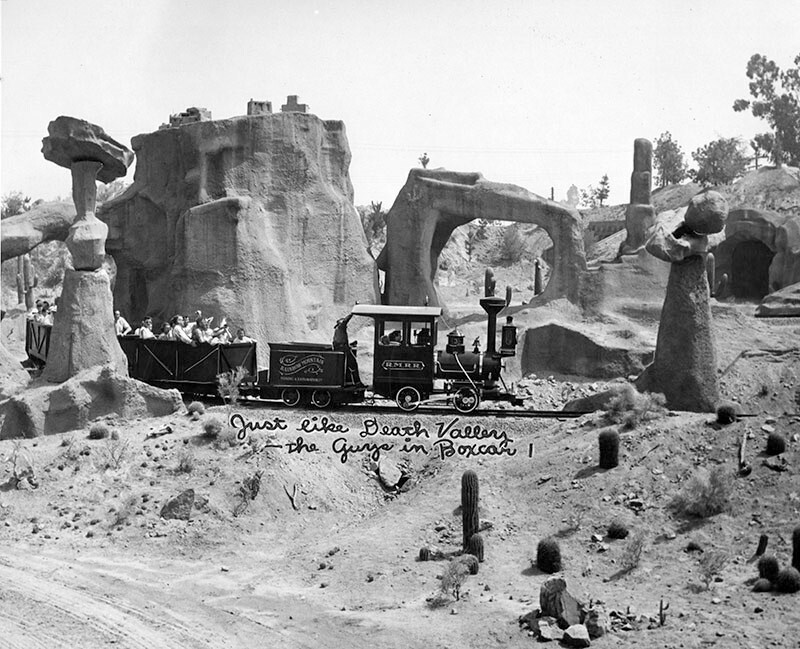 (1956)* - View showing a group of Valley Times newspaper boys riding the Rainbow Caverns Mine Train through the new Living Desert. Writing below the train reads, "Just like Death Valley - the Guys in Boxcar 1". 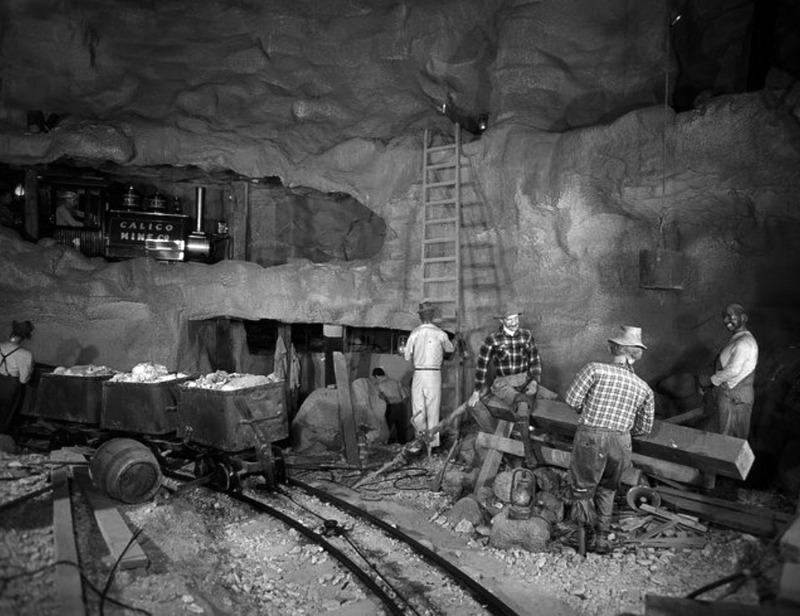 The Rainbow Caverns Mine Train Ride opened in 1956. It was a 2 ft. 6 in. narrow gauge mine train that ran through the new Living Desert. 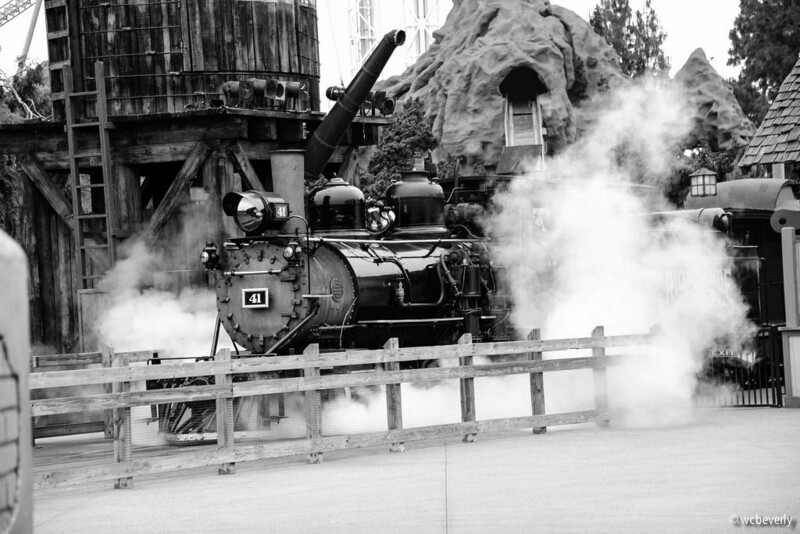 After the scenery was redone in 1960, it was upgraded and became Mine Train Through Nature's Wonderland. (ca. 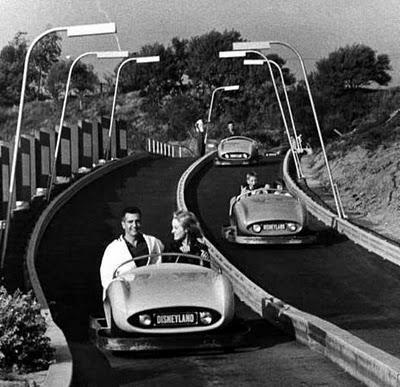 1955)*#^ - A family enjoying the first generation Autopia ride at Disneyland. These were gas powered go-karts that went about 6 mph. Fun for the kids; but not enough speed for a teenager or adult. More fun to bump the person in front of you if they stopped or slowed. The Disneyland Autopia is one of the few current attractions that opened with the park on July 17, 1955. When it opened, it represented the future of what would become America's multilane limited-access highways, which were still being developed. President Eisenhower had yet to sign the Interstate Highway legislation at the time Disneyland opened. (ca. 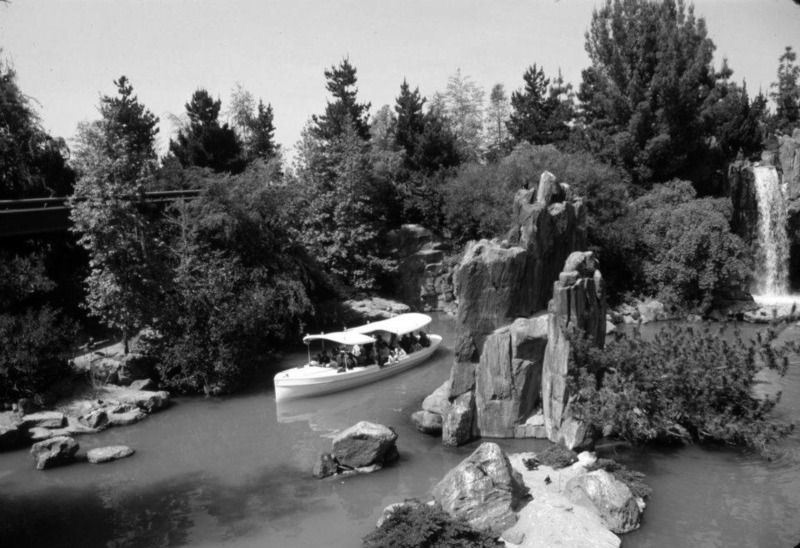 1955)*^*# – View showing a boat full of passengers on the Storybook Land Canal Boat Ride with the Casey Jr. Circus Train above and behind it. Storybook Land Canal Boats is a leisurely-paced outdoor boat ride through a winding canal featuring settings from Disney animated films recreated in miniature. 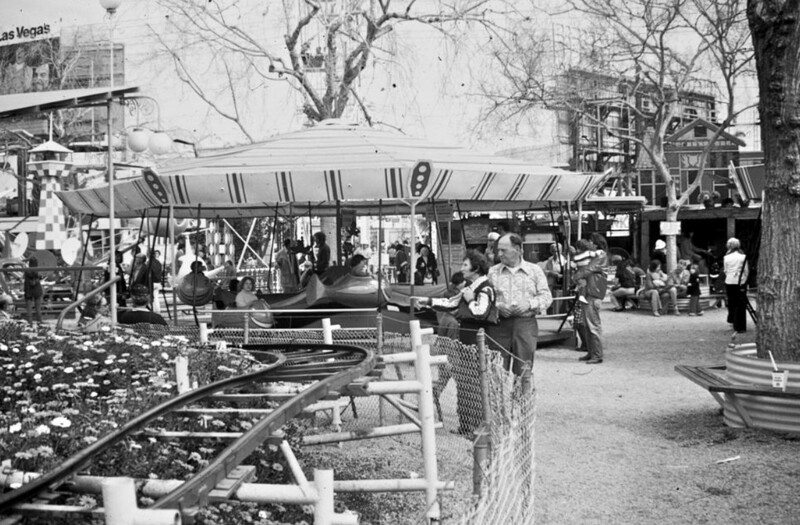 This was one of the original attractions when the park opened in 1955, although the miniature buildings and landscaping were not added until the following year. The Casey Jr. Circus Train was based on the train of the same name from the 1941 film Dumbo, it gives passengers a tour of many miniature versions of classic Disney animated film scenes. This tour is similar to the one given on the slower paced Storybook Land Canal Boats, but does not incorporate narration. 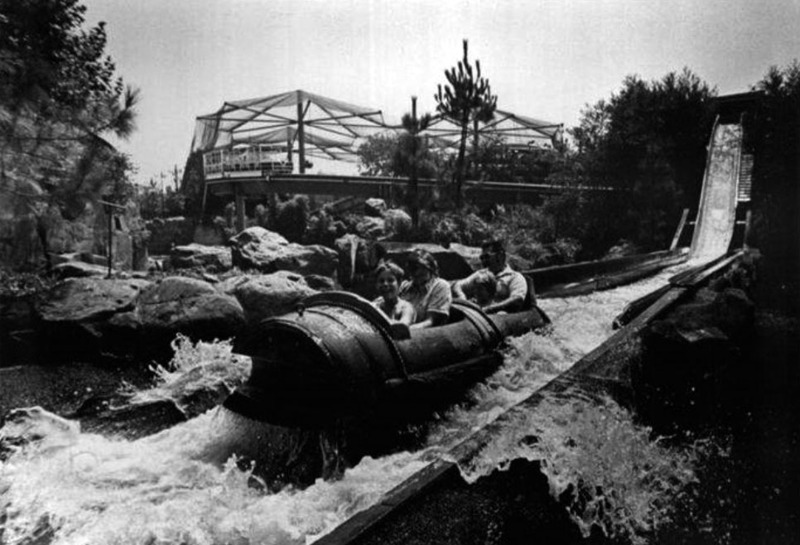 The attraction was opened two weeks later than Disneyland due to testing. (ca. 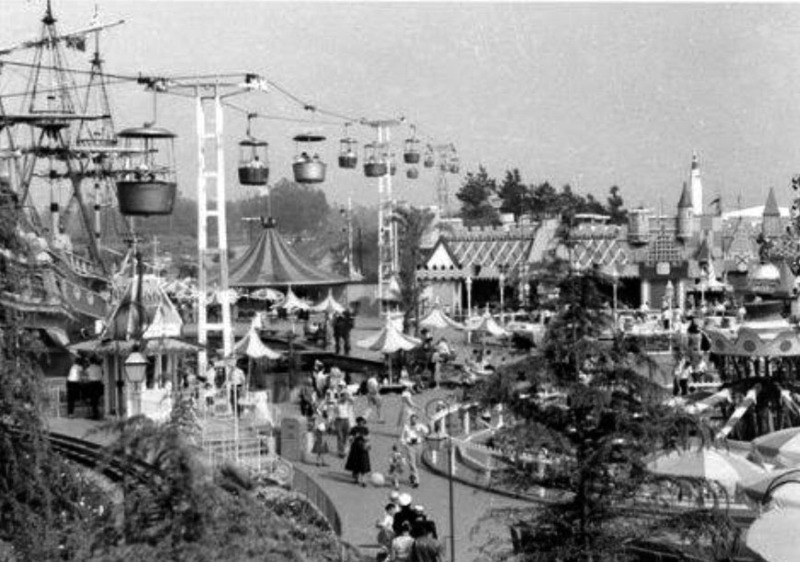 1955)#*^ - View of Fantasyland as it appeared in the 1950s, with Tea Cups at lower-left and King Arthur's Carrousel at center. Fantasyland is the area of Disneyland of which Walt Disney said, "What youngster has not dreamed of flying with Peter Pan over moonlit London, or tumbling into Alice's nonsensical Wonderland? In Fantasyland, these classic stories of everyone's youth have become realities for youngsters – of all ages – to participate in." 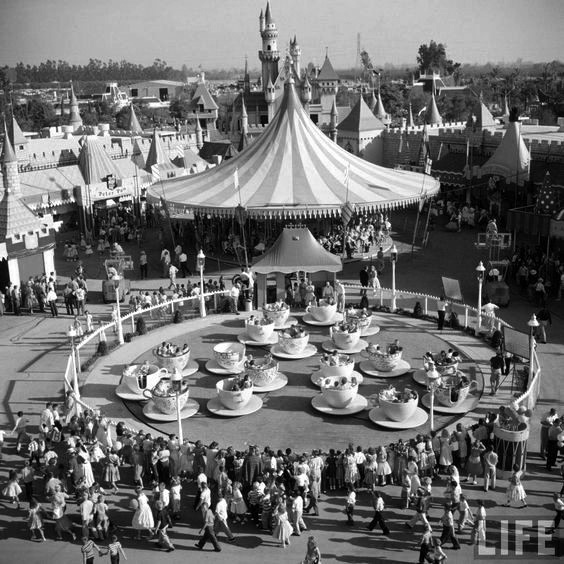 (1955)^x^ – LIFE Magazine photo showing the Mad Tea Party ride on the opening day of Disneyland, July 17, 1955. 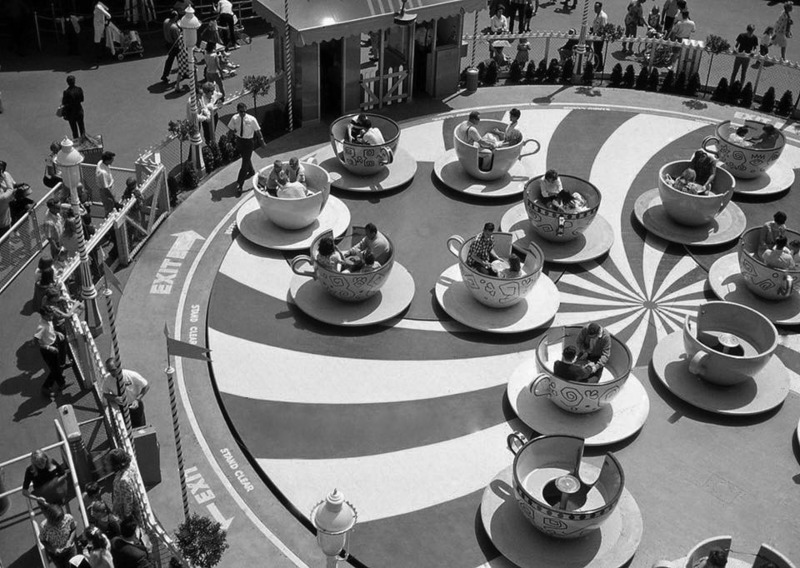 (1968)^## – Close-up view of the Mad Tea Party Ride in Fantasyland. 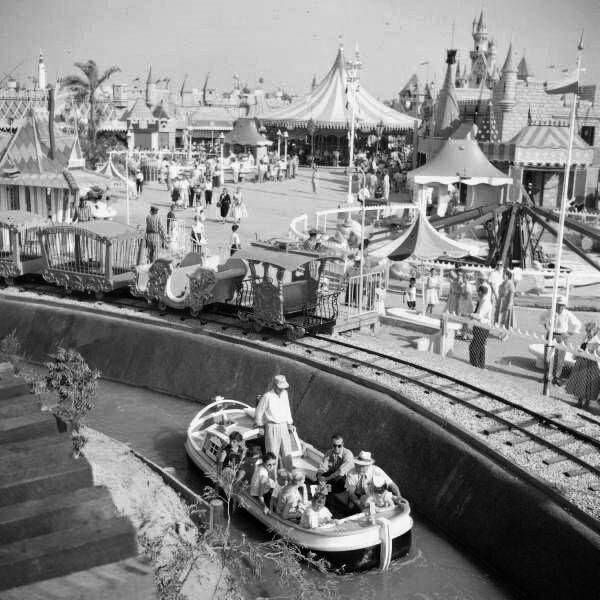 The ride was inspired by the Unbirthday Party scene in Walt Disney's Alice In Wonderland. (ca. 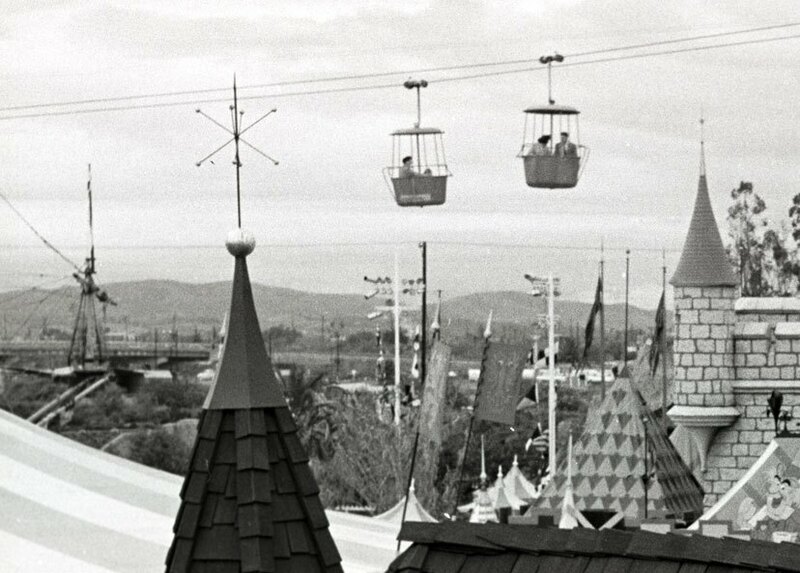 1956)^^# - View looking over the roofline of Fantasyland with the Skyway seen in the distance. (ca. 1956)^^# - Zooming in, you can see the Skyway Buckets, the masts of the Chicken of the Sea Pirate Ship restaurant, and the mountains in the distance. 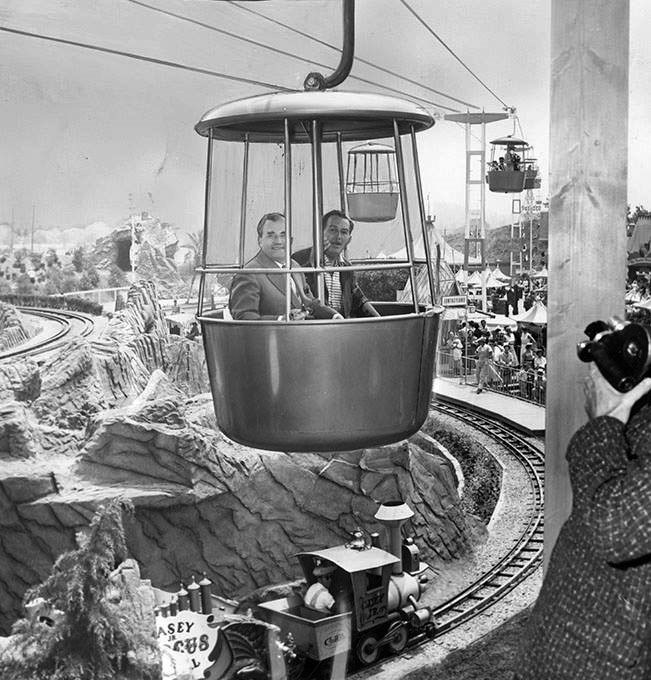 (1956)^^^* - Walt Disney and Dr. Walter Schmid, Swiss consul-general in Los Angeles, are the first passengers in Disneyland's newest attraction, the Skyway. June, 1956. 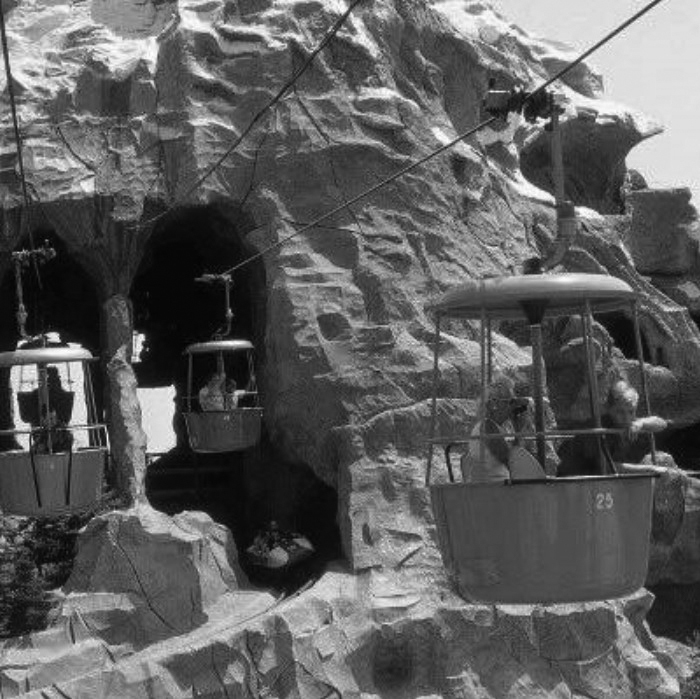 (1963)*^*# - View showing Skyway Buckets running right through the Matterhorn with bobsled making a sharp turn out of the mountain. 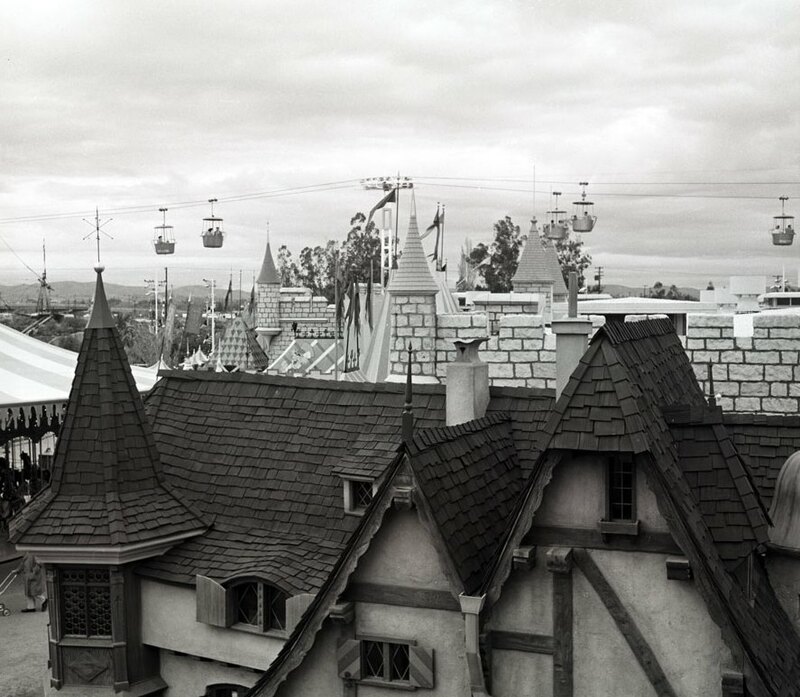 (1967)*^*# - View of the Disney Skyway over Fantasyland. Dumbo the Flying Elephant Ride is at lower right. 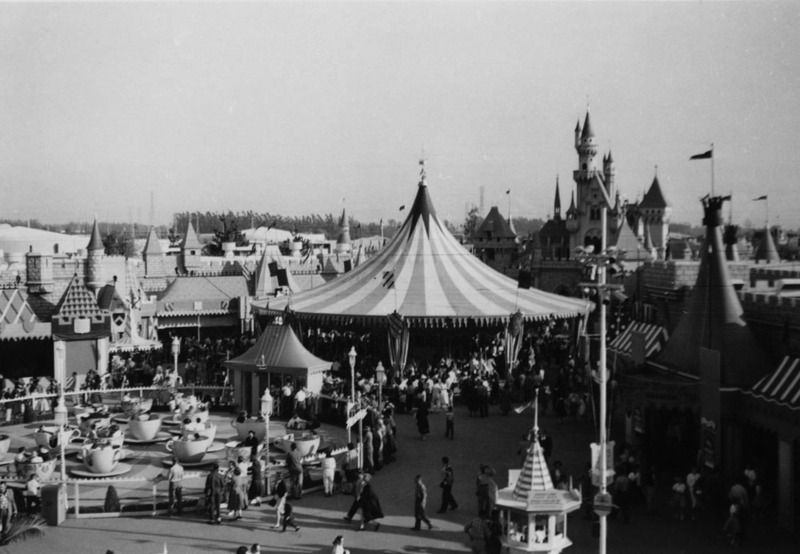 Dumbo the Flying Elephant opened at Disneyland in October 1955, three months after the park opened. (1960s)*^*# – View from the Disney Skyway looking down toward The Submarine Voyage and The Disney Monorail. 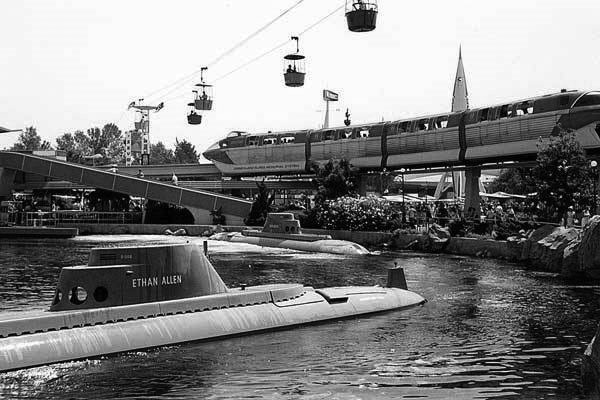 (ca 1960s)*^*# – Ground view showing the Submarine Voyage, Disney Monorail, and Disney Skyway. 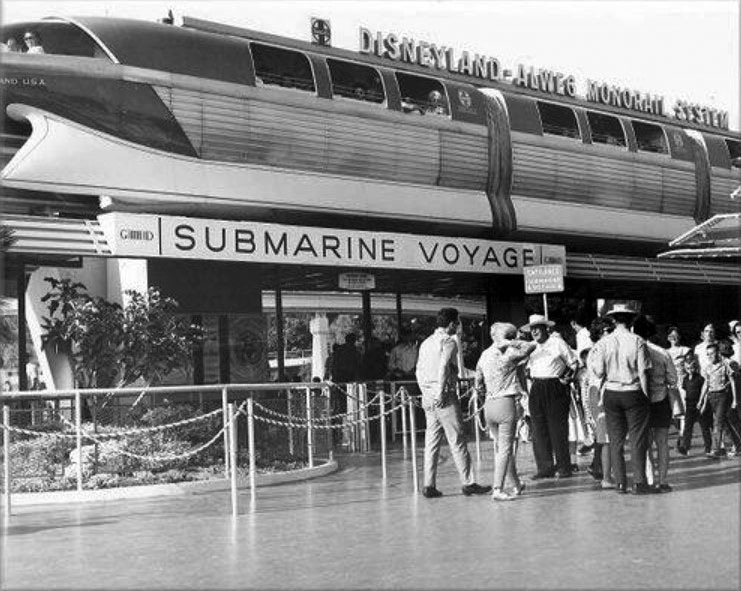 (1960s)*^*# - View showing the Disneyland ALWEG Monnorail over the entrance to the Submarine Voyage Ride. 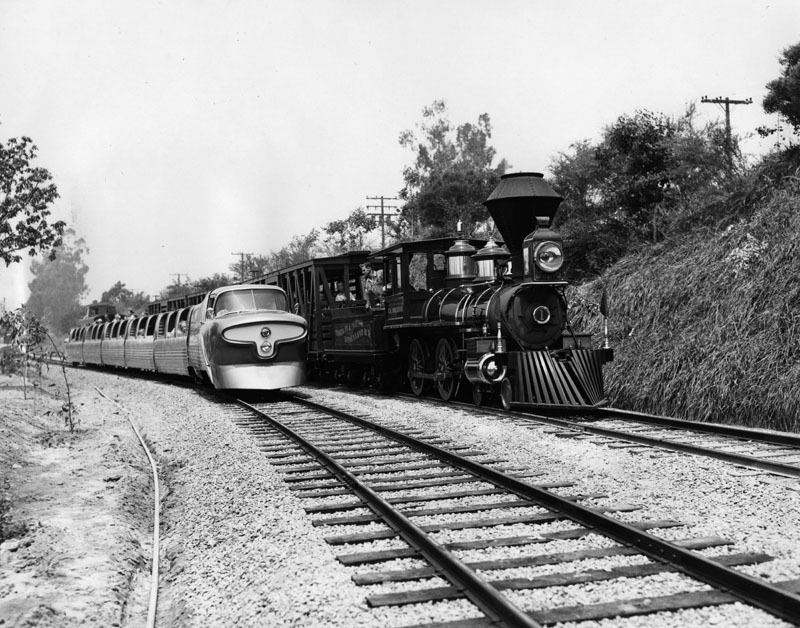 (1966)*^*# - View showing the Disneyland ALWEG Monnorail as it approaches the Disneyland Hotel. 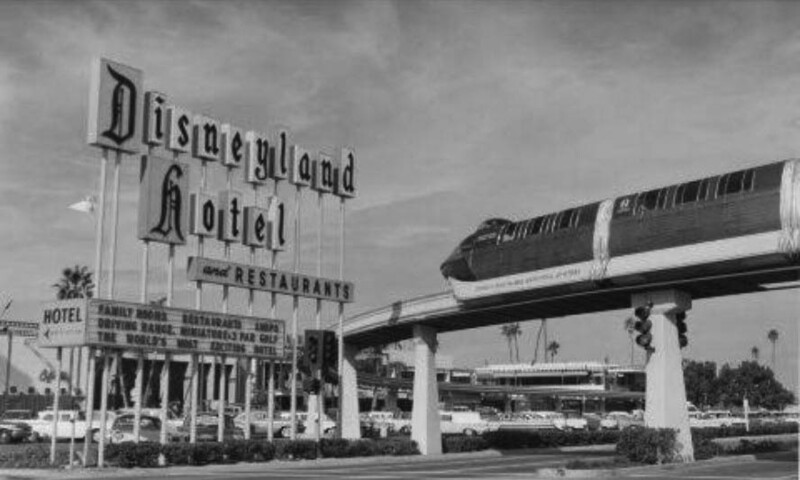 The Disneyland Hotel opened on October 5, 1955 as a motor inn owned and operated by Jack Wrather under an agreement with Walt Disney, the hotel was the first to officially bear the Disney name. Under Wrather's ownership, the hotel underwent several expansions and renovations over the years before being acquired by Disney in 1988. (ca. 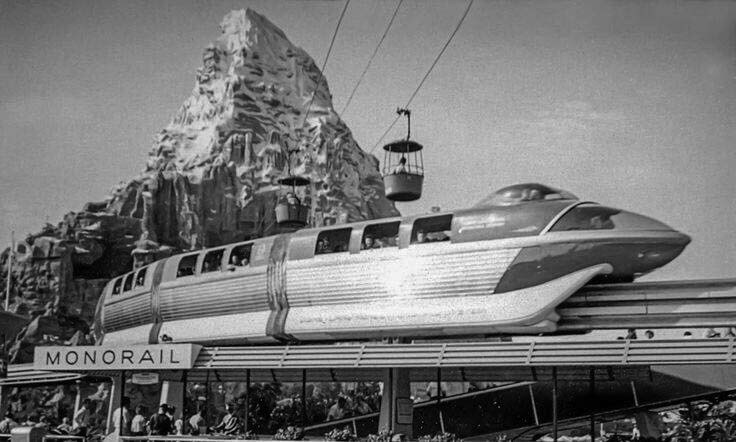 1964)*^*# – Classic view showing the Monorail, Skyway, and Matterhorn. 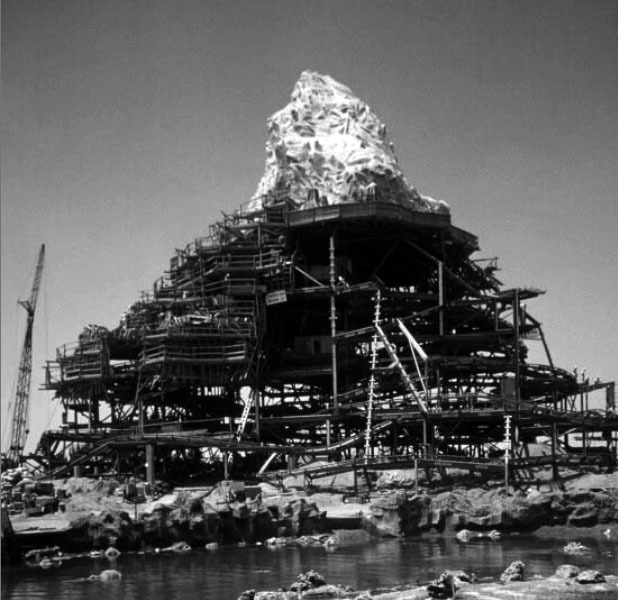 (1958)*^*# – View showing the Matterhorn under construction. 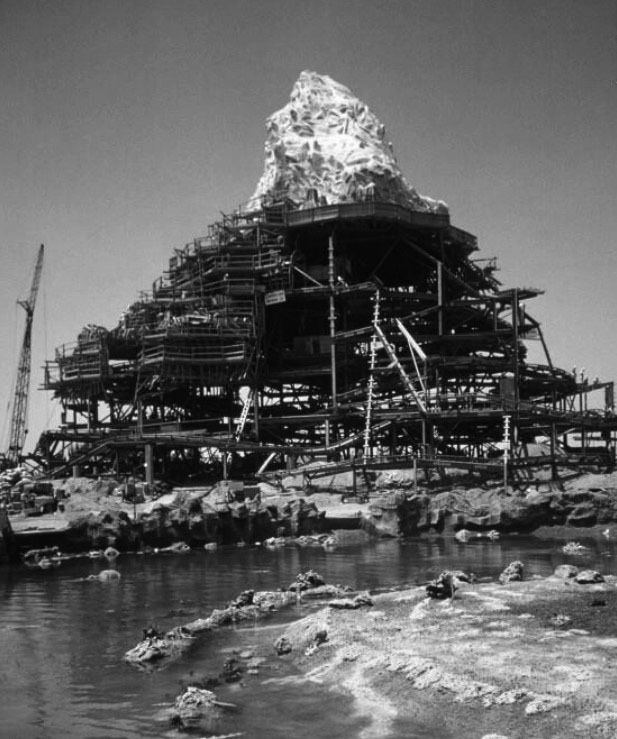 The Matterhorn mountain and sleds opened on June 14, 1959. 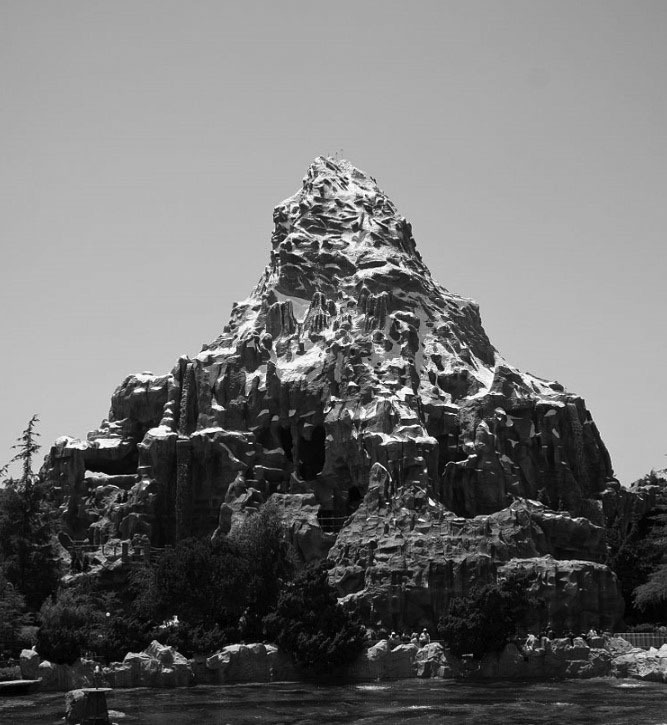 (2012)^ – View of the Matterhorn mountain after its 2012 refurbishment. 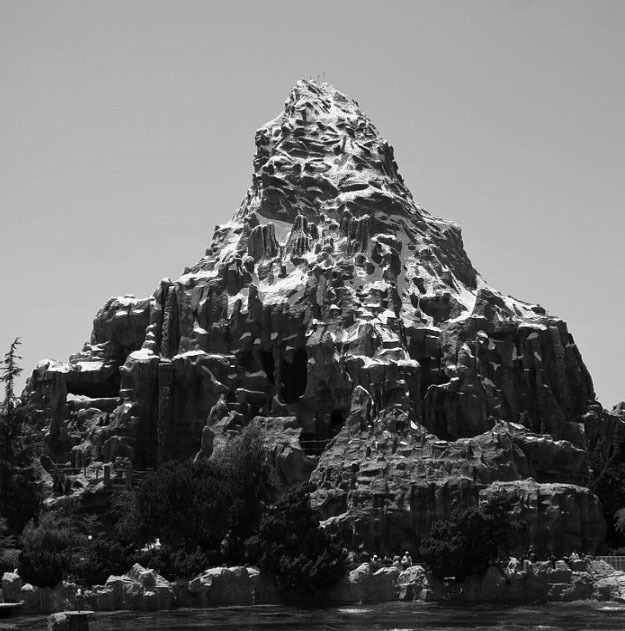 (1958)*^*# - Disneyland's Matterhorn Mountain. (2012)^ - Disneyand's Matterhorn Mountain. (ca. 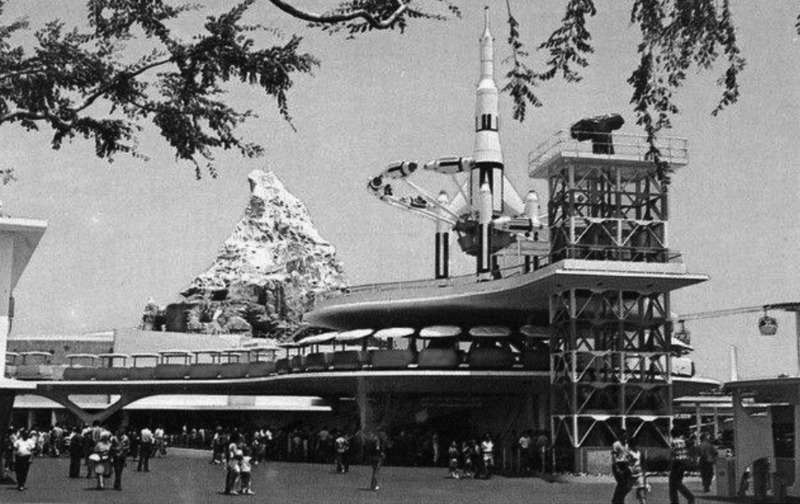 1967)*^*# - View showing the People Mover with the Rocket Jets Ride and Matterhorn in the background. 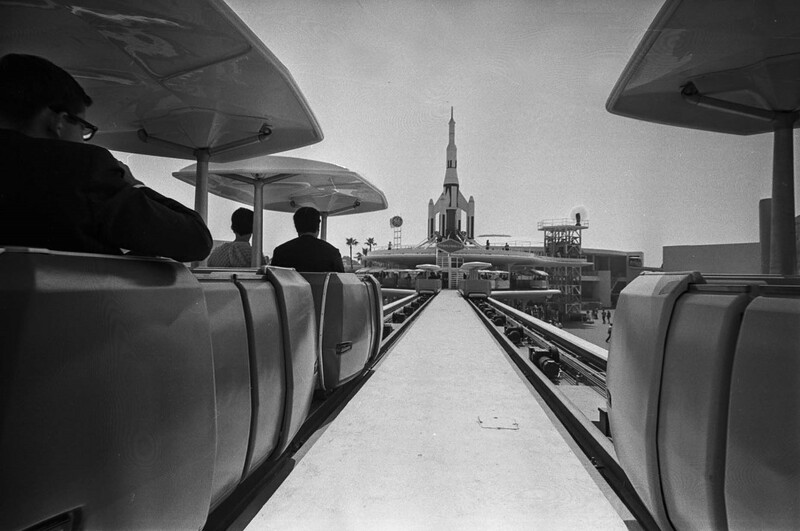 (1967)*^# - PeopleMover opens at Disneyland. The People Mover is run through a remodeled Tomorrowland during press preview of the new Disneyland attraction. 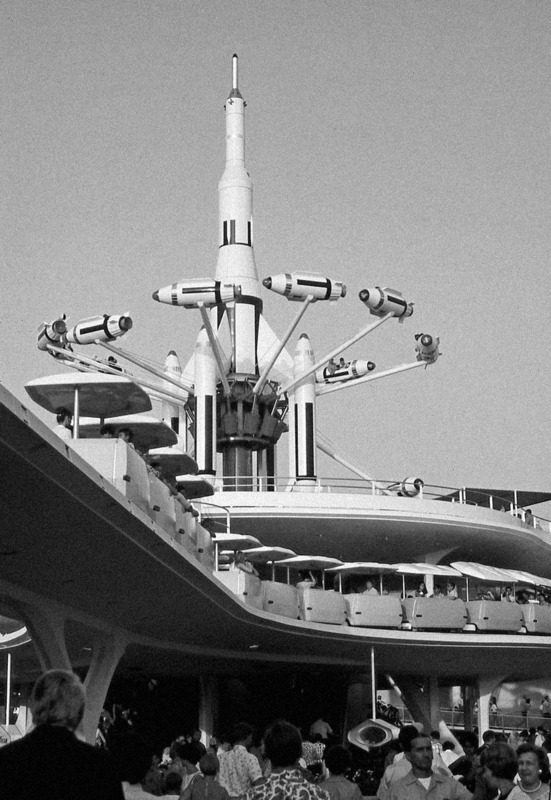 (1967)^#^# - Close-up view of the Rocket Jets Ride and the People Mover located in Tomorrowland. (ca. 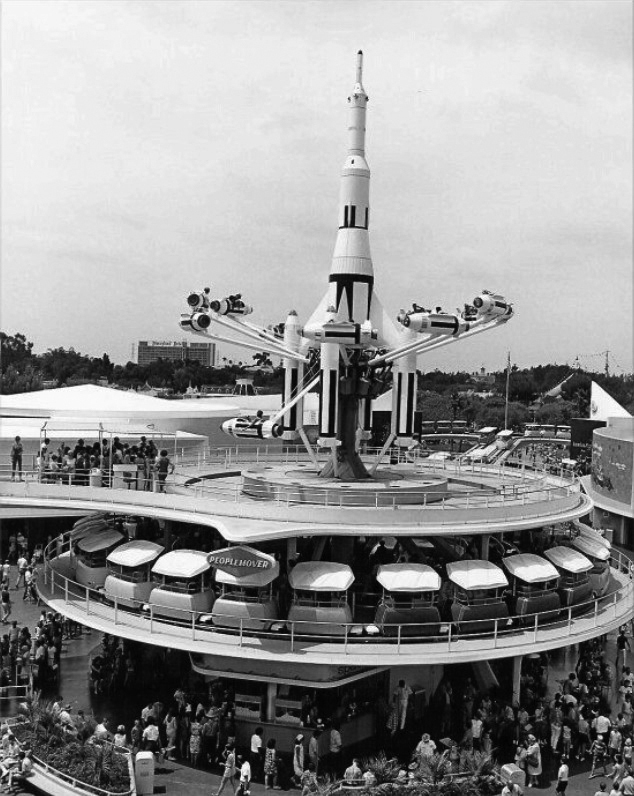 1967)*^*# – View showing the Rocket Jet Ride with the entrance to the People Mover directly below it. 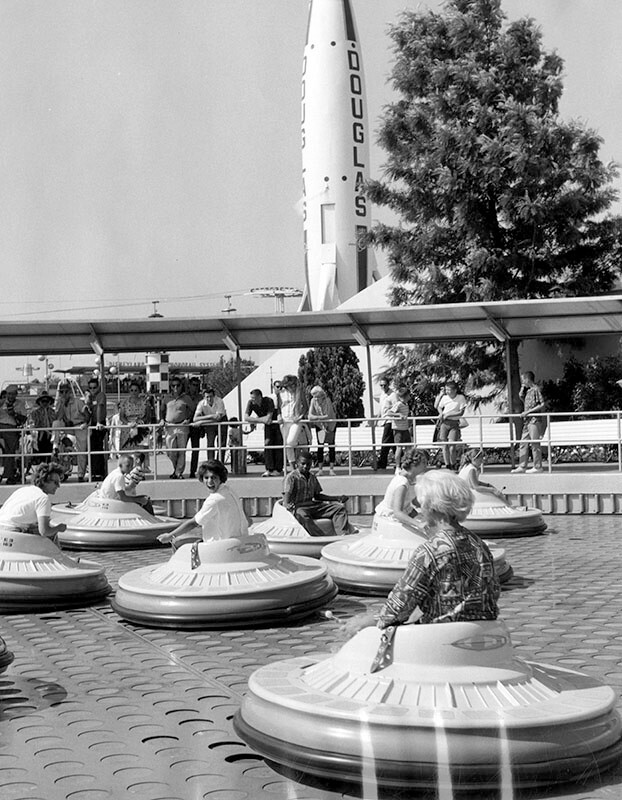 (1962)* - The Flying Saucers operated from 1961 to 1966. The space occupied by the ride became the Tomorrowland Stage when New Tomorrowland opened in 1967. 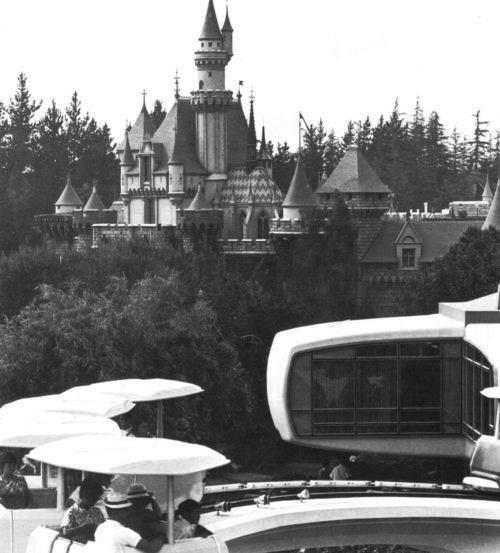 (1960s)^.^ - Sleeping Beauty Castle; Home of the Future... with the People Mover in the foreground. (1957)^v^ – View showing the Monsanto House of the Future in Tomorrowland with Sleeping Beauty Castle seen in the background. 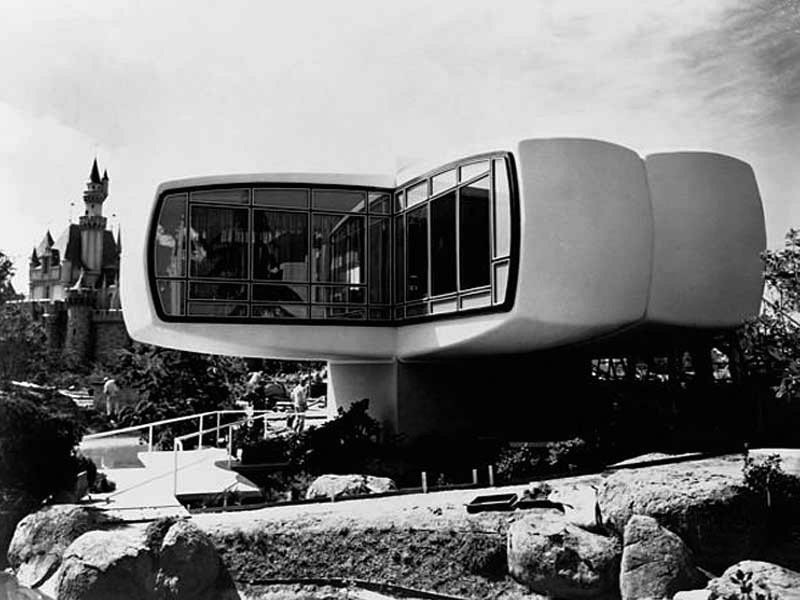 The Monsanto House of the Future (also known as the Home of the Future) opened at Disneyland’s Tomorrowland in 1957. 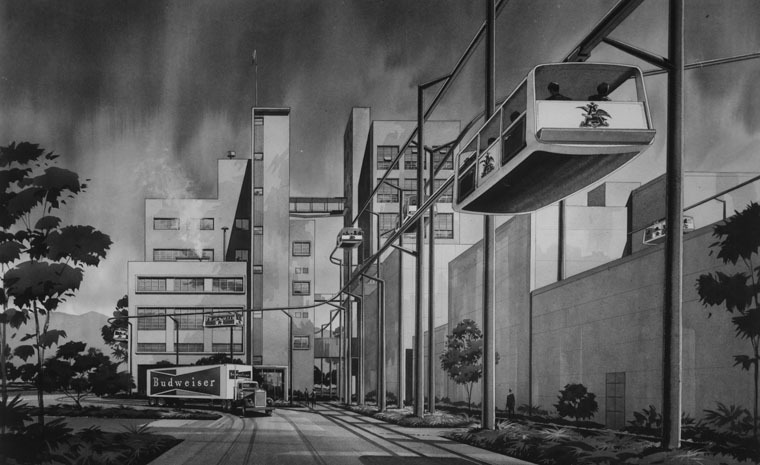 Sponsored by Monsanto, the design and engineering of the house was done jointly by Monsanto, Massachusetts Institute of Technology, and Walt Disney Imagineering. (ca. 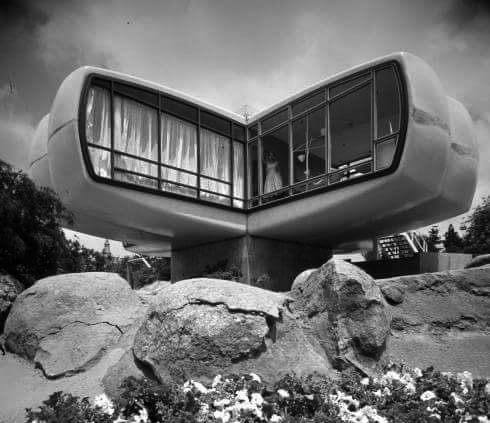 1957)^## - View showing a woman standing by the floor-to-ceiling window inside the Monsanto House of the Future located in Tomorrowland. The house closed in 1967. The building was so sturdy that when demolition crews failed to demolish the house using wrecking balls, torches, chainsaws and jackhammers, the building was ultimately demolished by using choker chains to crush it into smaller parts. 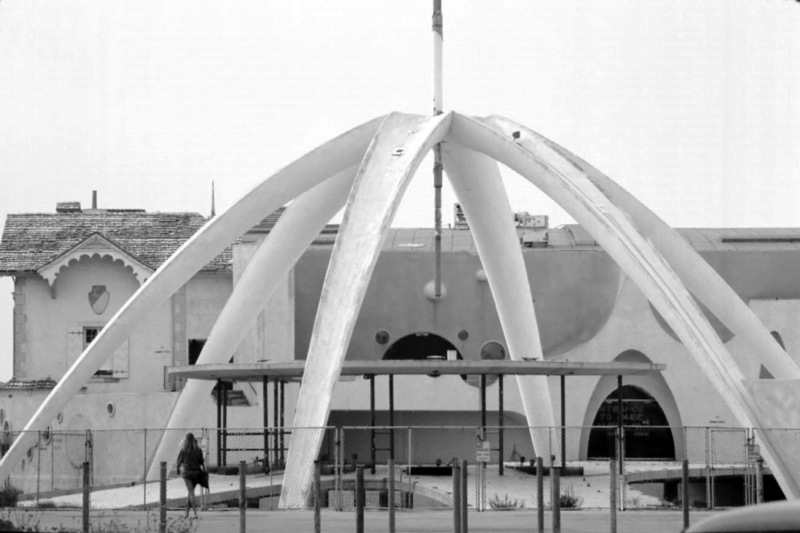 The reinforced polyester structure was so strong that the half-inch steel bolts used to mount it to its foundation broke before the structure itself did. 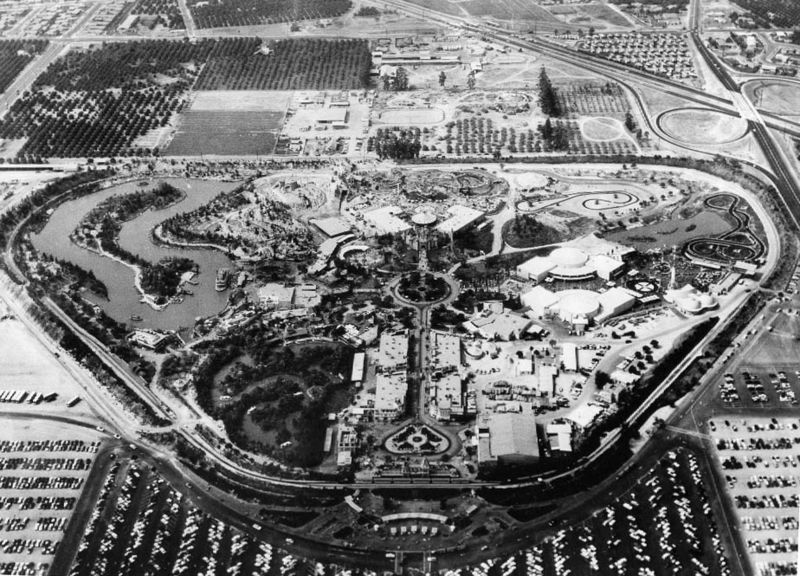 (1962)^ - Aerial photo of Disneyland taken in June, 1962. Tom Sawyer Island can be seen in the lower right. 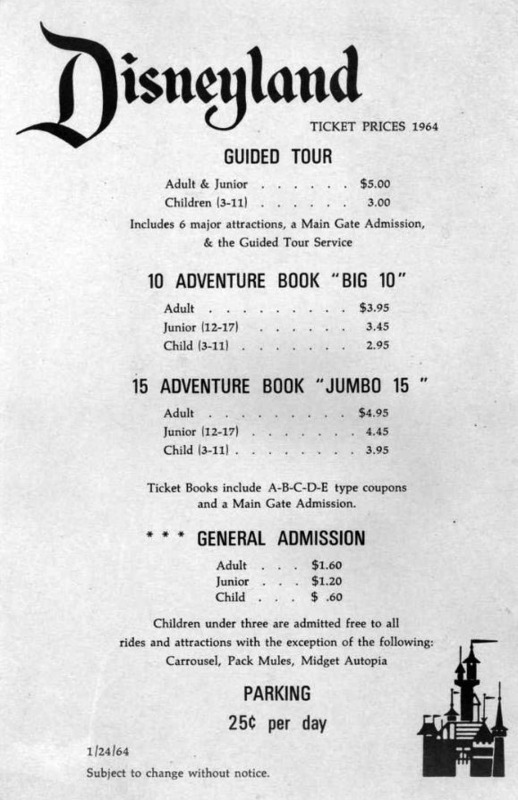 (1964)+# - Disneyland prices for admission, tour, rides, and parking in 1964. (ca. 1977)^ - Disneyland ticket book circa 1975–1977. The tickets were printed as "coupons". 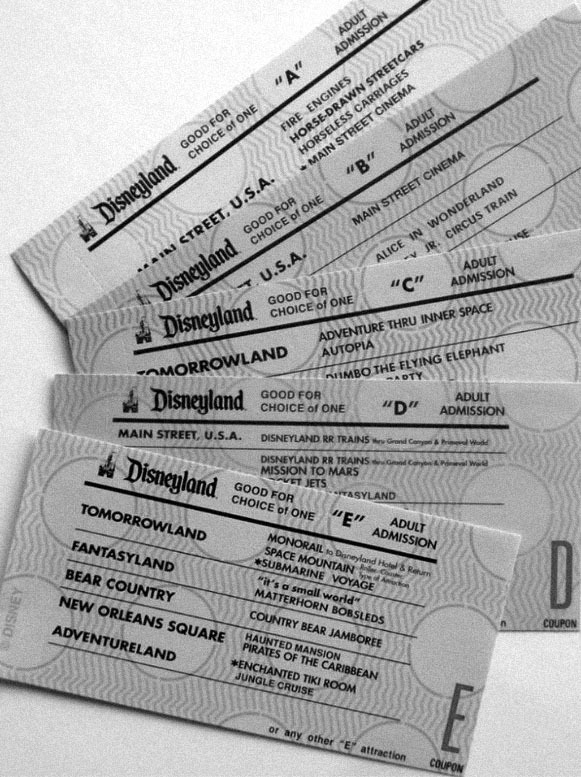 From the thrill ride experience at Disneyland, the colloquial expression "an E ticket ride" is used to describe any exceptionally thrilling experience. 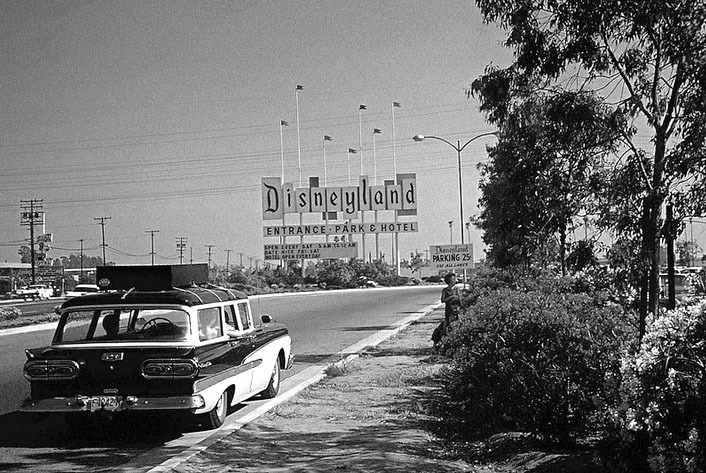 (1960)#^#^ – A 1958 Ford Country Sedan is parked on the side of the road leading up to the Disneyland parking lot. A woman is seen admiring the flowers while the family sits patiently in the car. Note the parking lot sign reads 25 cents. Parking today is $20. (ca. 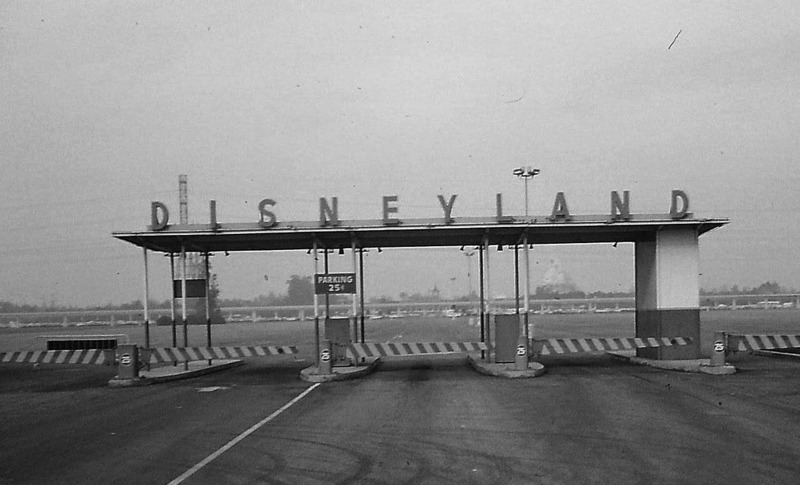 1960)*^*# – PARKING 25¢ - View showing the Katella Avenue entrance to Disneyland. The Matterhorn (built in 1958) can be seen in the distance. (ca. 1960)*^*# - View showing the entrance to Disnelyand. Looks pretty much like it does today.....except maybe for the crowds. (1965)* - Photograph caption dated February 9, 1965 reads, "Disneyland's Town Square is filled with turn-of-the century atmosphere, old-fashioned vehicles and happy people. Compare this to the Disneyland of ten years ago. Soon the Opera House (center) will house 'Great Moments with Mr. Lincoln,' Walt Disney's newest 'three-dimensional experience in history' for Disneyland guests. It will be opened in mid-year as a major feature of the Park's Tencennial Celebration." 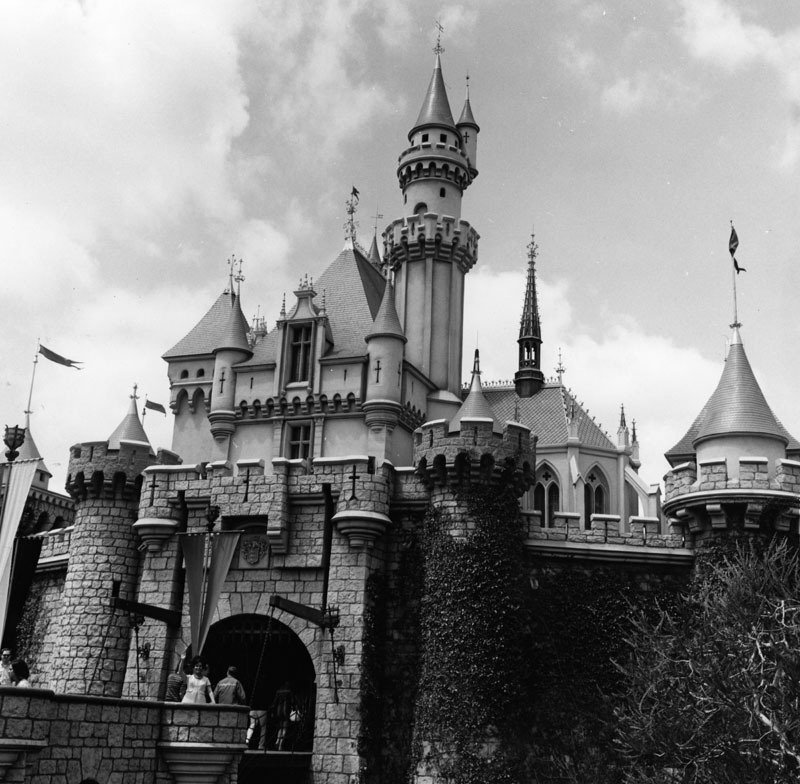 (n.d.)* - View of Sleeping Beauty's Enchanted Castle at the entrance to Fantasyland. 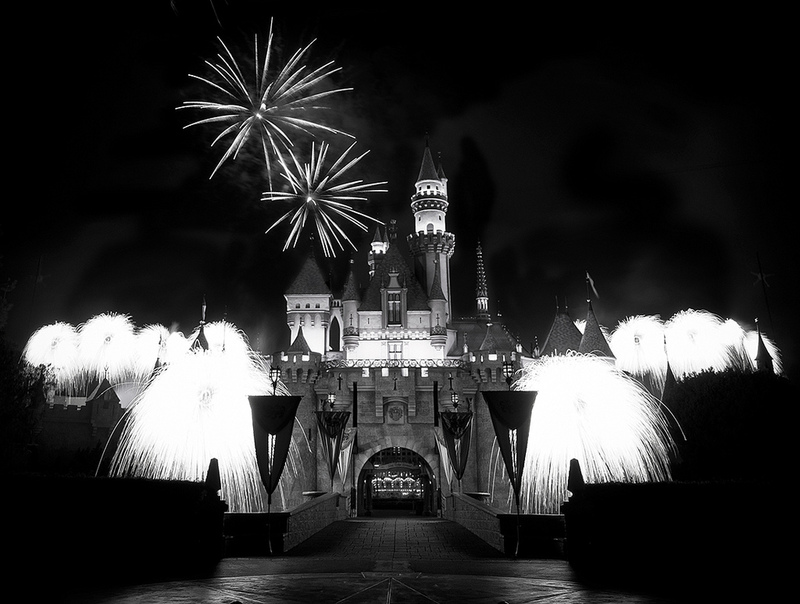 (2010)** - View of fireworks above and around Sleeping Beauty's Enchanted Castle. 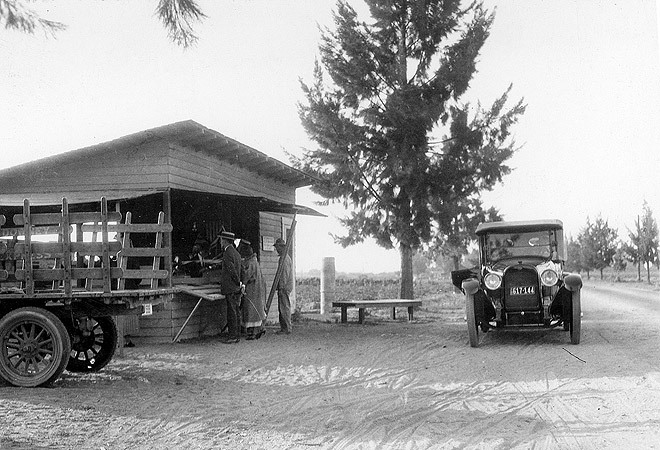 (1926)^*^* - Walter Knott's roadside berry stand along Western Avenue in 1926. (n.d.)^^* - Walter and Cordelia Knott, the power couple behind Knott’s Berry Farm, stand in front of one of their original stands. The license plate on the Model T dates to 1920, the year the couple came to Buena Park to farm berries. 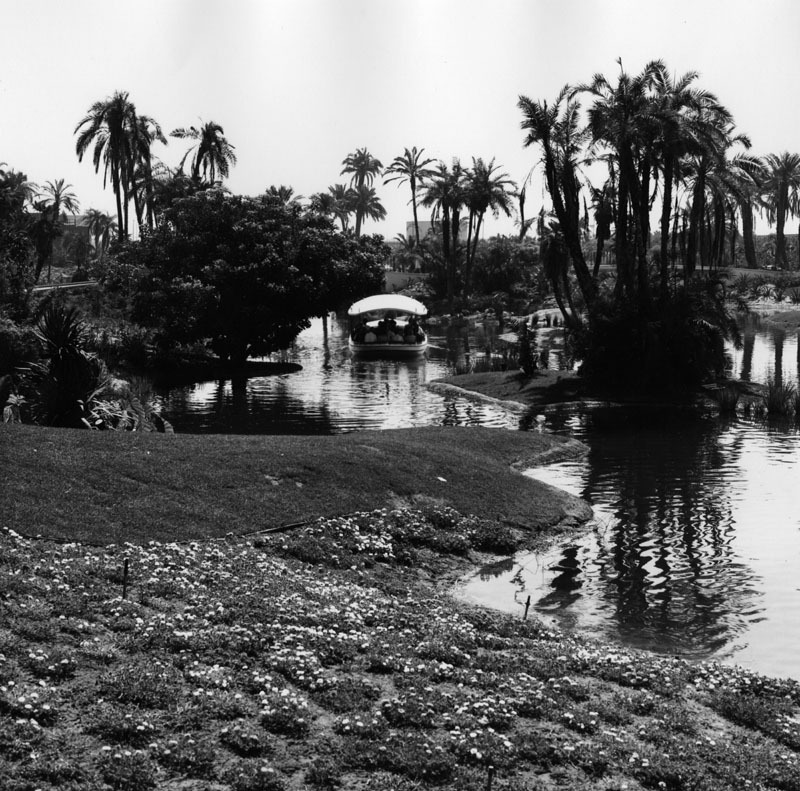 Walter Knott and his family developed their Buena Park berry farm into a popular tourist attraction in the 1920s. 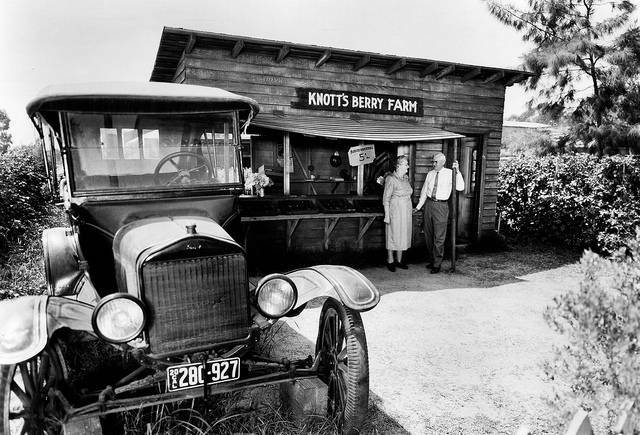 Originally selling berries, homemade berry preserves and pies from a roadside stand, Knott built a restaurant, shops and stores onto the property by the 1930s. 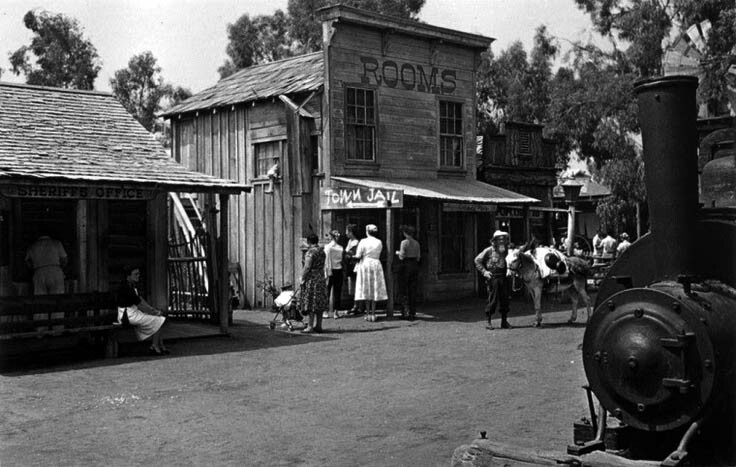 These were then augmented with minor attractions and curiosities until Knott gradually created Ghost Town, transforming them from a way-point to a Western themed destination in 1940. (ca. 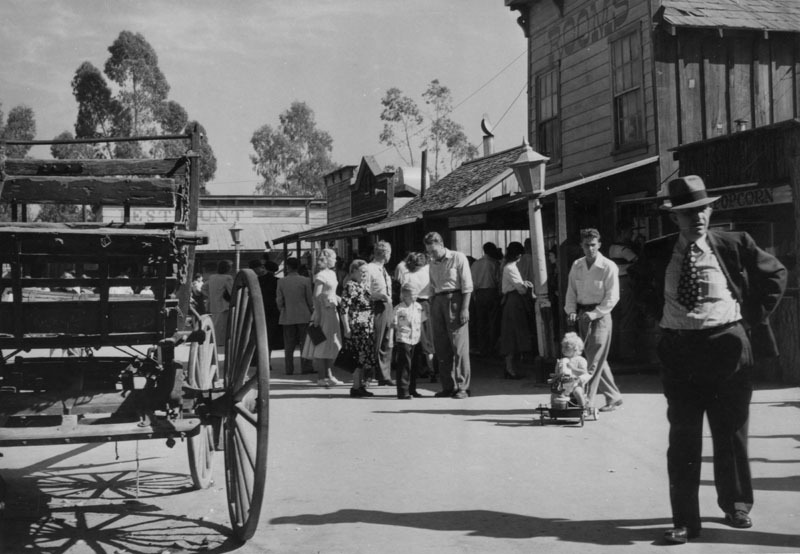 1950)* - Visitors at Knott's Berry Farm stand near old-style businesses. At left is an antique horse-drawn wagon. (ca. 1950s)##* - View of the Sherff's Office and Gold Dust Goldie's Hotel. Goldie's leg can be seen hanging out of the window. (ca. 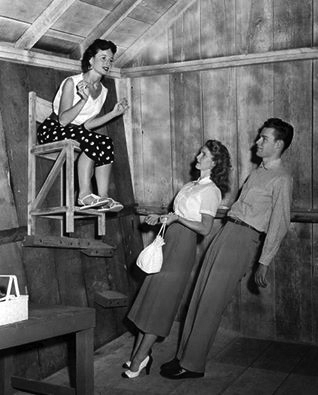 1954)^*^# - View showing three people experiencing the gravitational mysteries of the "Haunted Shack". 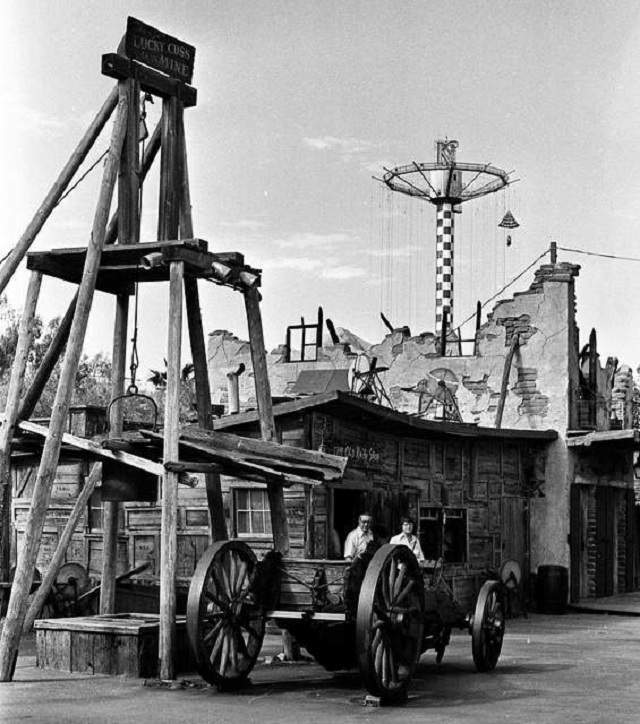 The Haunted Shack was an attraction at Knott's Berry Farm from 1954, until it was demolished in 2000. 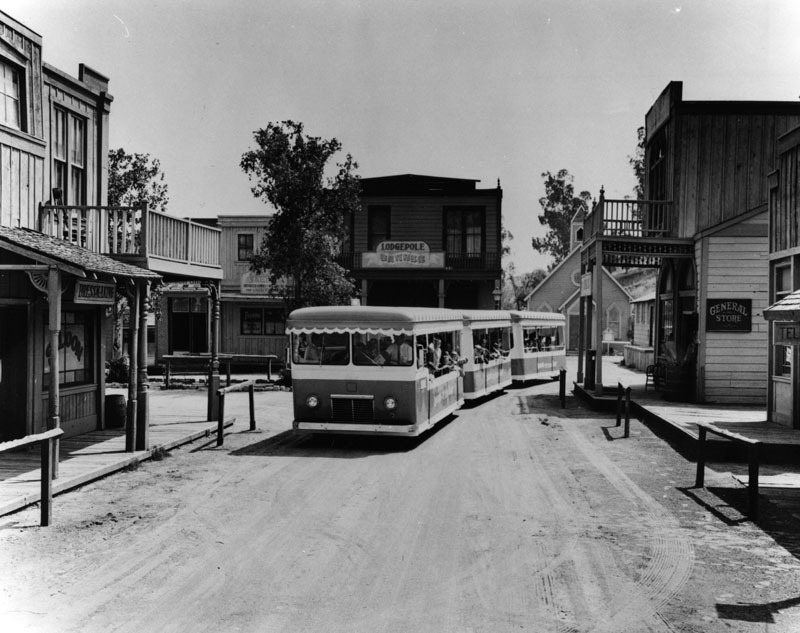 (1958)* - A stagecoach to Ghost Town at Knott's Berry Farm. Visitors are riding on top, as the bearded driver holds the reins. 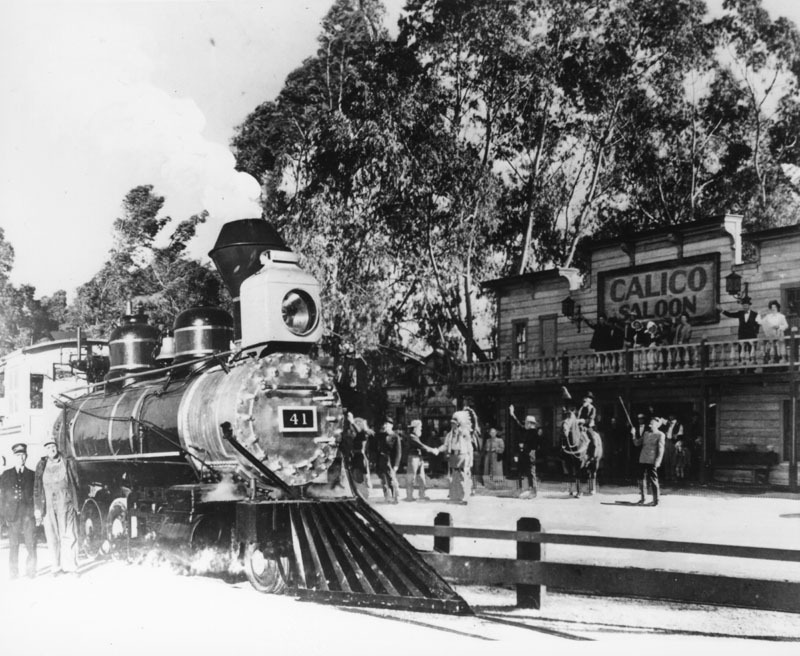 (1958)* - An older-model train near the Calico Saloon at Knott's Berry Farm. Employees of the western-theme park are dressed in period costumes. (2013)** - View of the same No. 41 train fifty-five years later at Knotts Berry Farm. (ca. 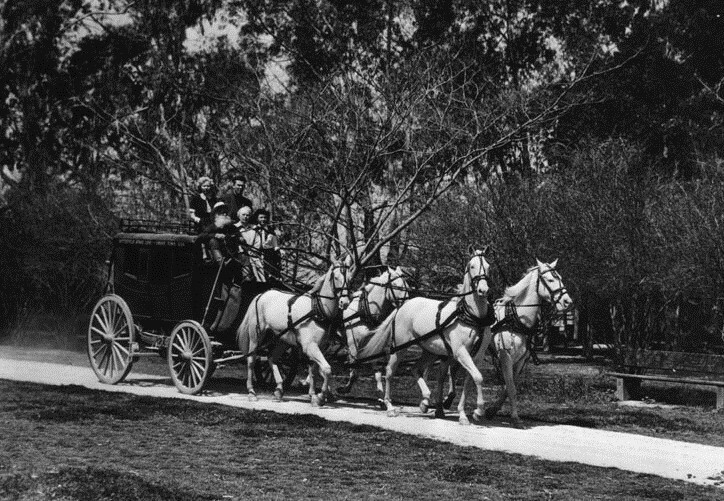 1950s)##^ - View showing a group of people enjoying a mule ride at Knott’s Berry Farm. The Calico Mine Ride is seen in the distance. (ca. 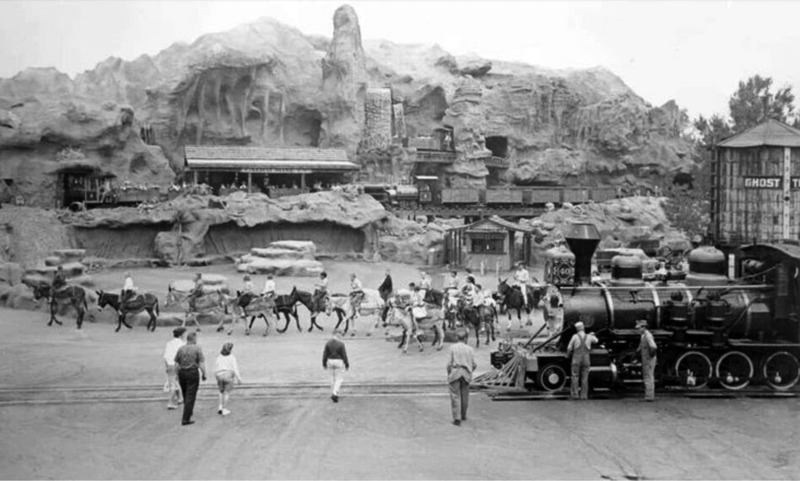 1960)##^ – View showing a train taking passengers through the Calico Mine next to a scene filled with animated miners trying to strike it rich. 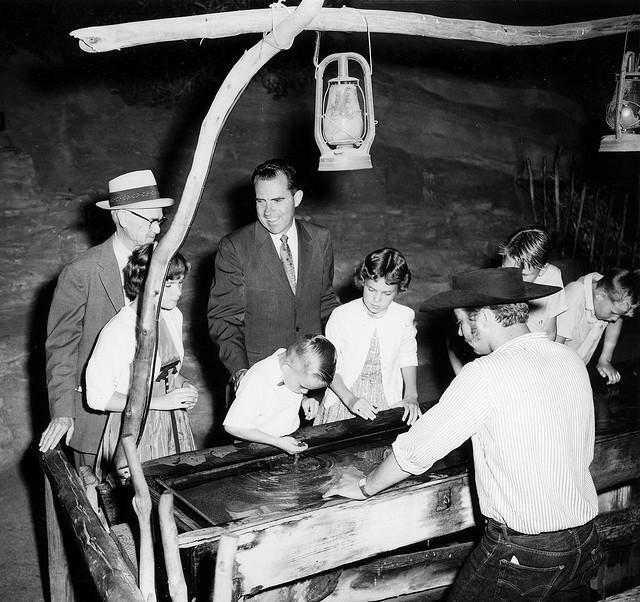 (1959)^^* - View of Walter Knott and Vice President Richard Nixon at the "Pan for Gold" attraction. 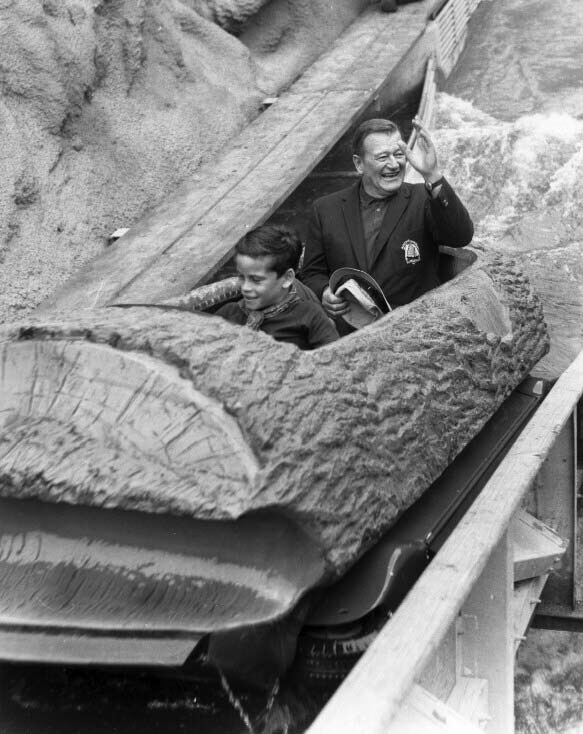 (1969)##* - Ethan and John Wayne on the log ride at Knott's Berry Farm. (ca. 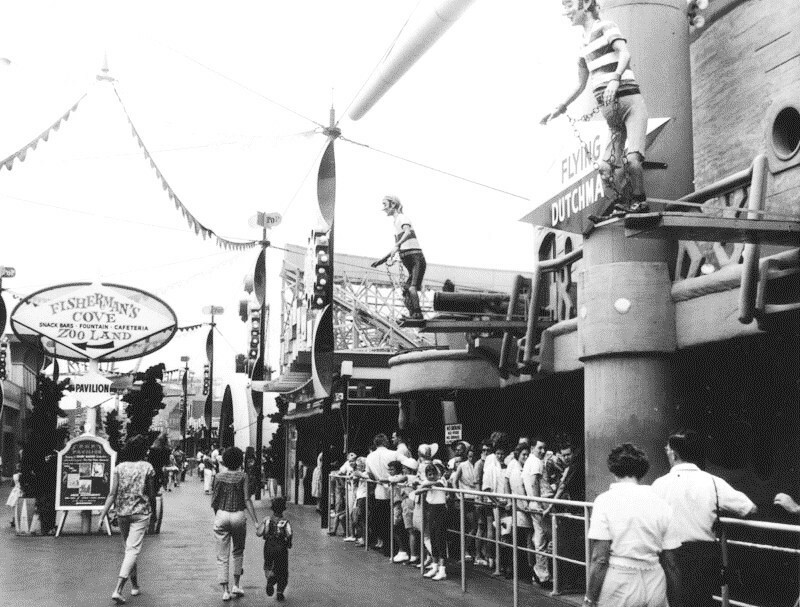 1976)^^* - The Old Knife Shop with the newer “Sky Jump” parachute tower in the background. (1970s)*^*# - Poster for Hanna-Barbera's Marineland located at Rancho Palos Verdes. (ca. 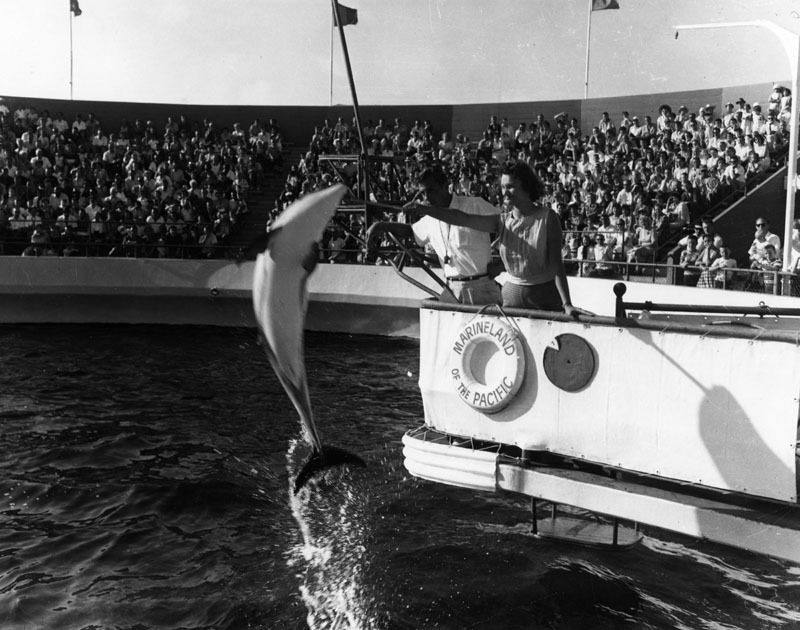 1957)* - View of Marineland showing its very large oceanarium, designed by the firm Pereira & Luckman. (ca. 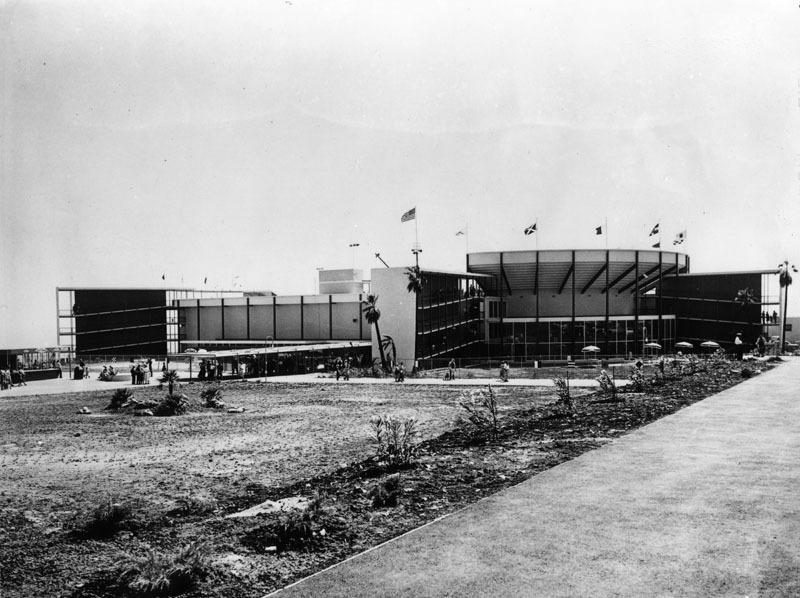 1950s)*^*# - Close-up view showing the main entrance to Marineland of the Pacific's Oceanarium. 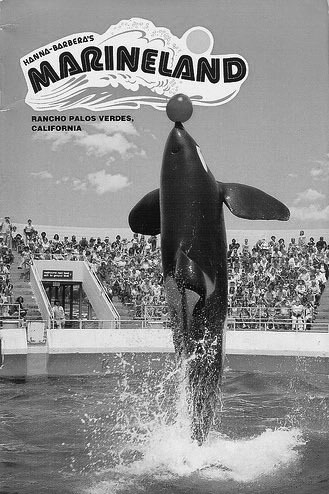 (n.d.)* - Performing porpoise at Marineland in Rancho Palos Verdes. 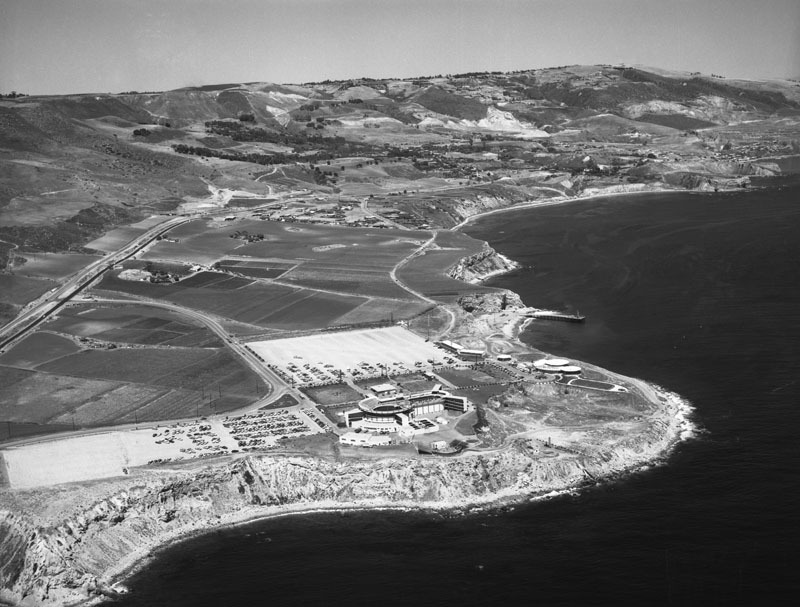 (1957)* - Aerial view of Marineland of the Pacific, located in Rancho Palos Verdes; view is looking slightly northeast. Palos Verdes Drive is visible from middle left to upper right; a few houses can be seen farther in the distance, and the Pacific Ocean flows on the right. 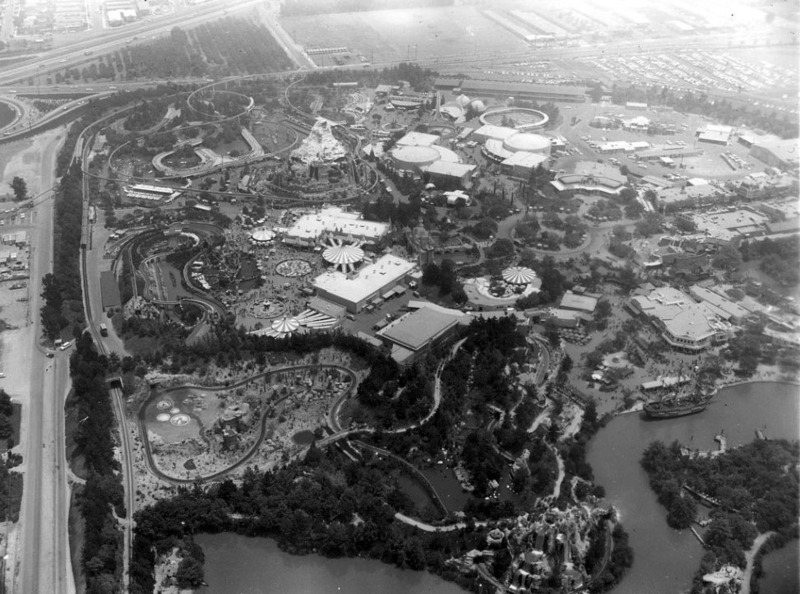 (1957)* - Aerial view of Marineland of the Pacific looking north. Palos Verdes Drive is visible running horizontally at the top. (ca. 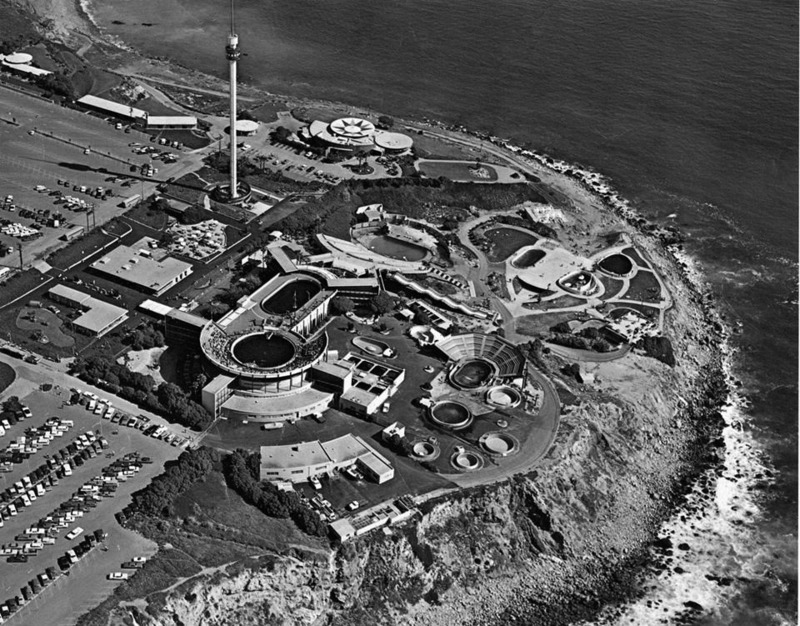 1960)^*## – Postcard aerial view showing Marineland of the Pacific. (1970s)^* - Aerial view of Marineland as it appeared in the early 1970s. 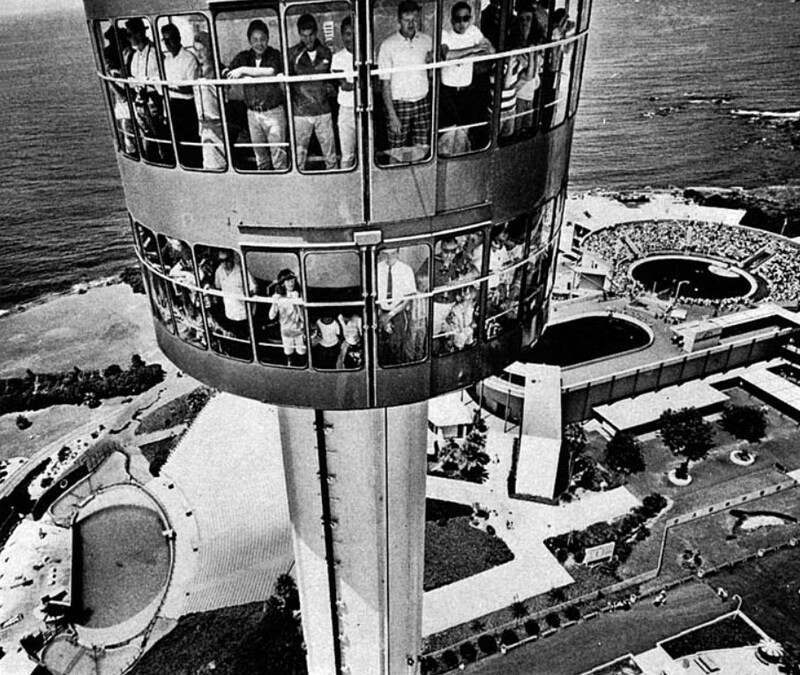 (1966)*^# - Visitors aboard the recently opened Marineland Sky Tower get a 360-degree panorama of the park and Palos Verdes. The ride carried 60 visitors 314 feet above the park. 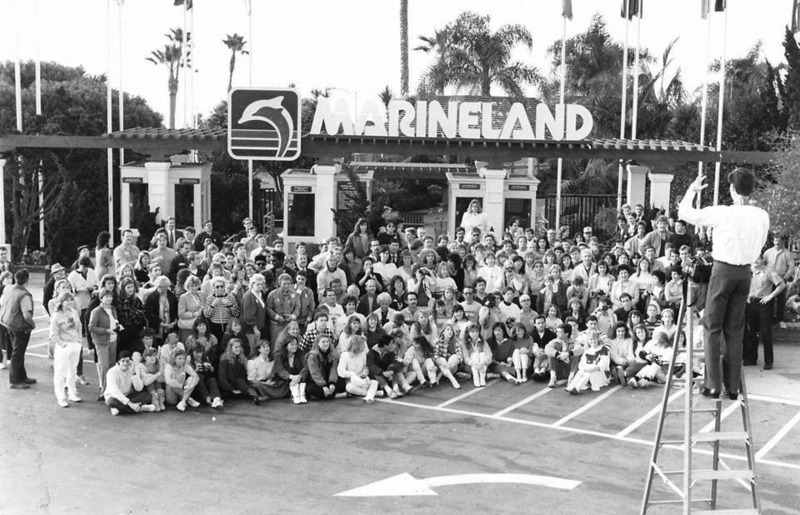 (1987)*^*# - MARINELAND EMPLOYEES pose for company photo on February 3, 1987. Sea World would close the park permanently just 8-days later. 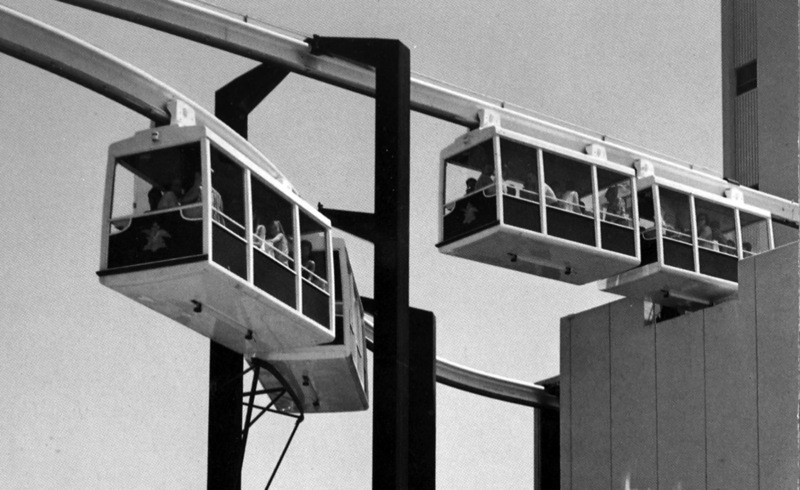 (1960's)^** - View of what appears to be a Busch Gardens Sky Trolley being tested and fine-tuned prior to its official opening. 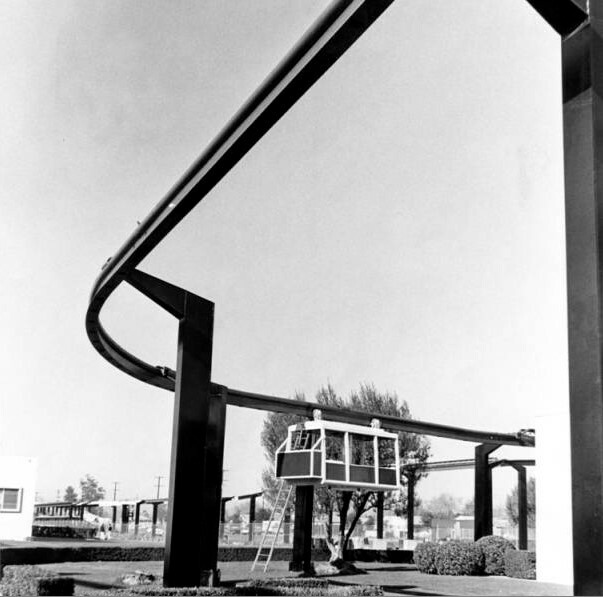 (1966)*^# - View shows the Busch Monorail car moving forward at the ribbon cutting ceremony dedicating the new Busch Gardens in Van Nuys. 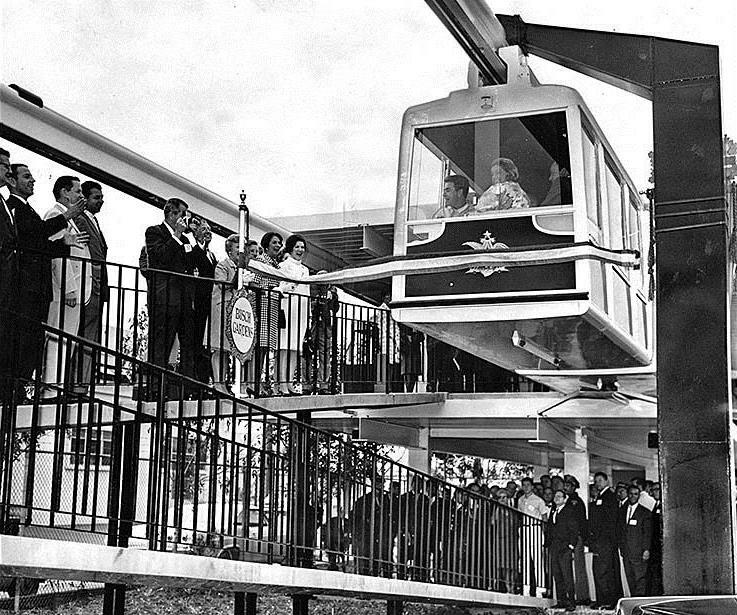 (1960s)*#^ - Poscard view of the Monorails at Busch Gardens in Van Nuys. (1970s)* - Passengers line up as they prepare to board the Busch Gardens boat ride. (1970s)#*^* – View of the Log Ride at Busch Gardens, Van Nuys, with the Bird Sanctuary seen in the background. (ca. 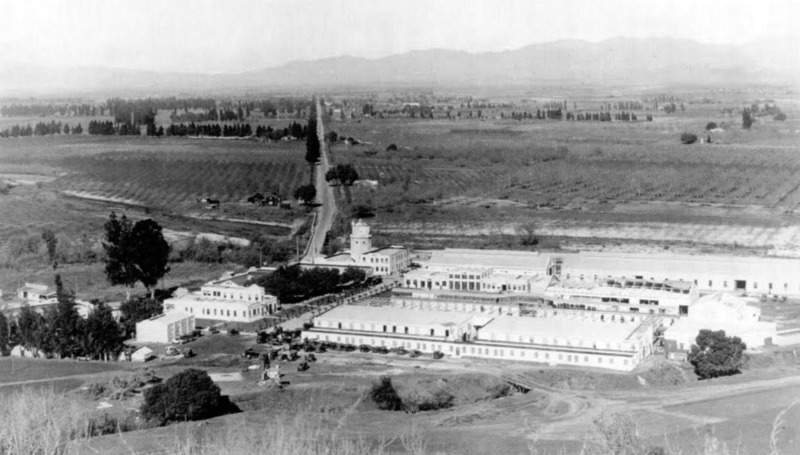 1914)**^# – Panoramic view looking southwest showing Universal City. 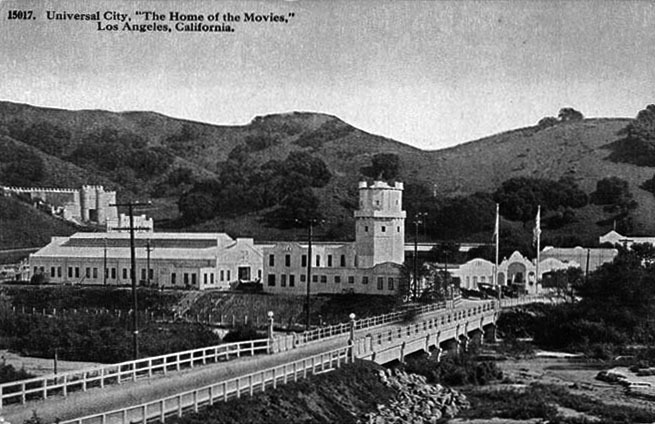 The water tower at center-right would later be converted into a castle tower. The Lankershim Blvd Bridge can be seen to the right of the tower. (Universal Handout Photo). 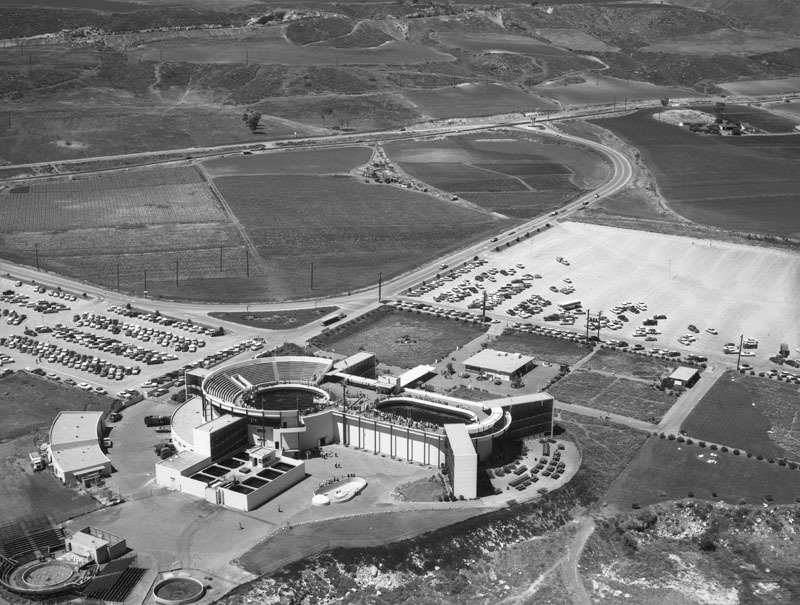 The main buildings consisted of two main stages, Universal Studio Tours, and the production support facilities that were on the north side of the lot. 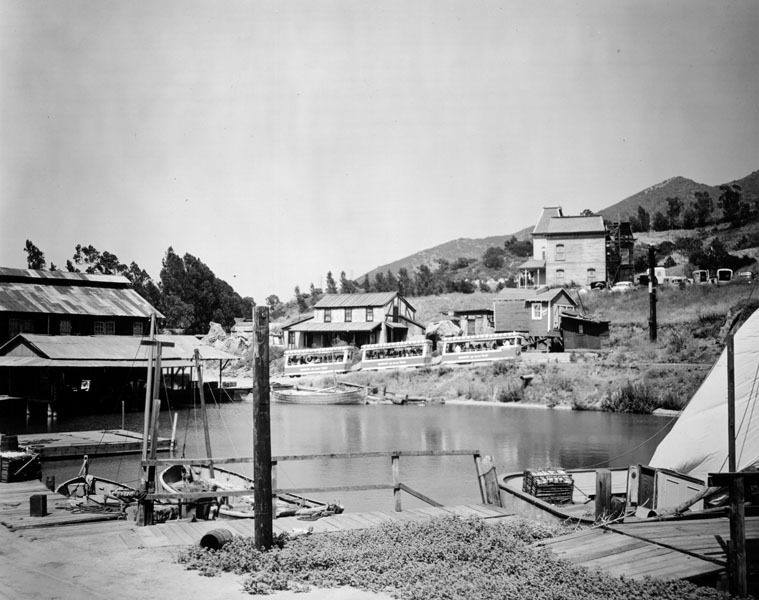 At this time, the studio had formerly opened on Lankershim Boulevard. 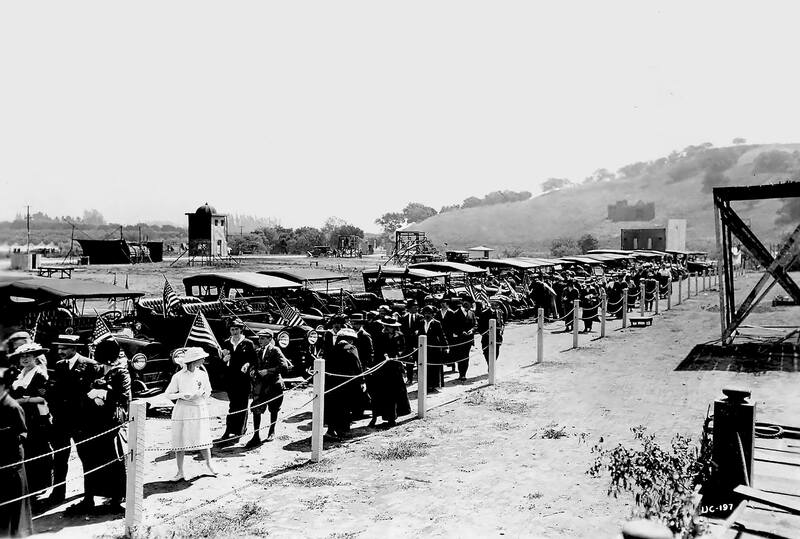 (1915)^^^* - Crowds arrive, some carrying American Flags, to help celebrate the opening of Universal City on March 15, 1915. 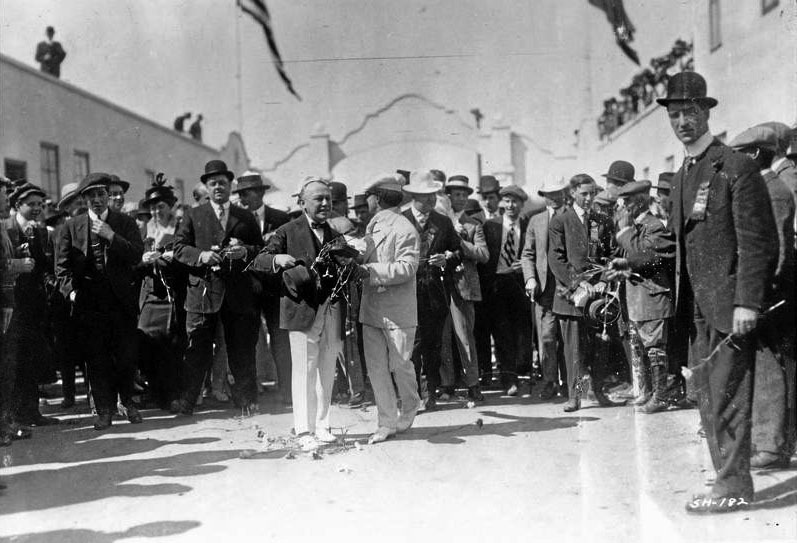 (1915)**^# – View showing the beginning of Opening Day festivities just inside the front gate at Universal City. 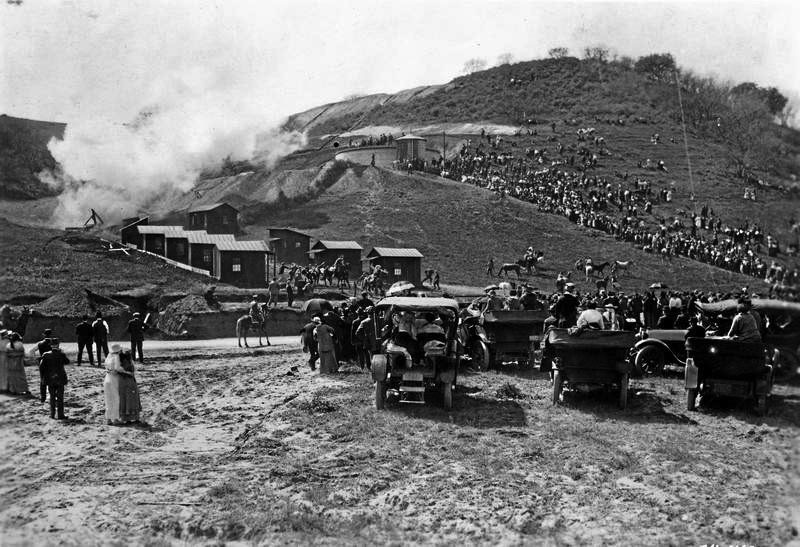 (1915)**^# – Crowds are seen gathered on hillside and below in autos to watch the Opening Day ceremonies of Universal City on March 15, 1915. Smoke fills the sky most likely from cannon fire or fireworks. (ca. 1916)^#^ – Postcard view showing bridge over the Los Angeles River leading to the front entrance to Universal City, “The Home of the Movies”. The tower building near the front entrance is actually a water tower modified to resemble a castle tower (see earlier photo). (ca. 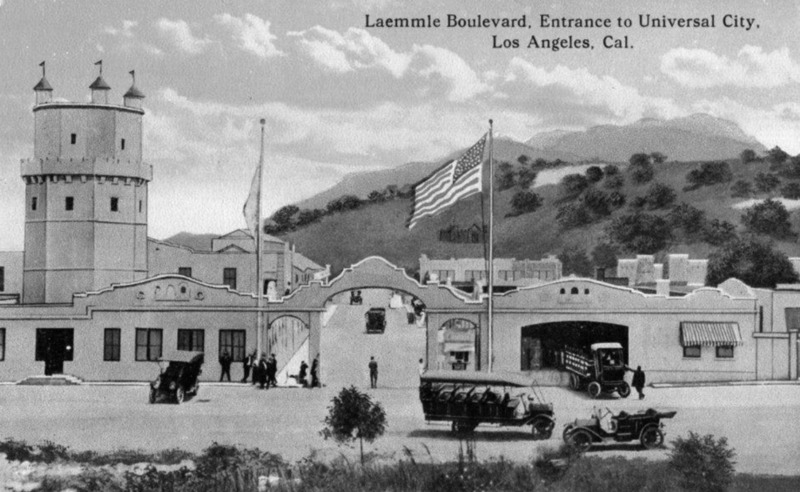 1916)#^#^ - Postcard view showing Laemmle Boulevard and the Entrance to Universal City. (ca. 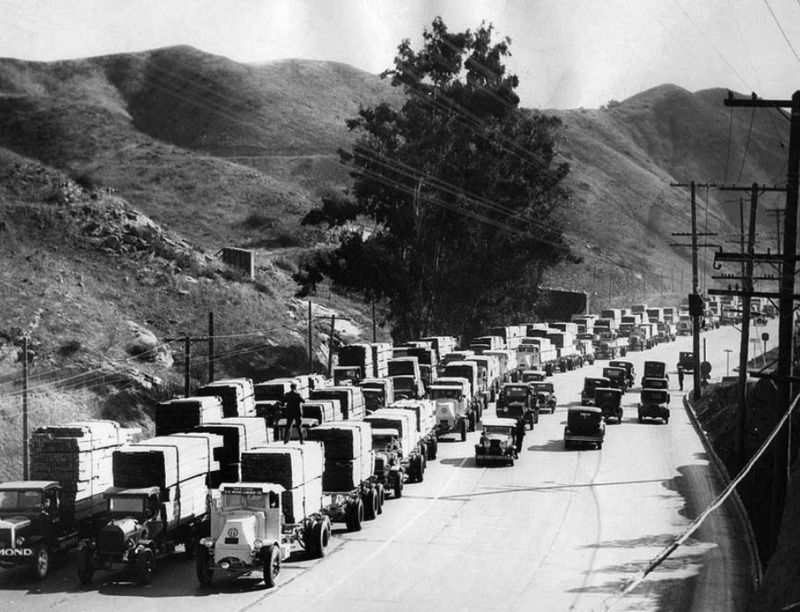 1916)*^^ - View showing the Lankershim Blvd. entrance to Universal Studios. 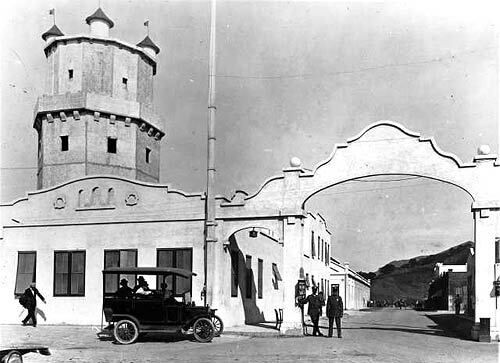 Two security gaurds in uniform stand at watch under the large archway. A tall castle-like tower is seen on the left. Passengers sit in the back of an early model vehicle, possiblly the precursor to today's tram ride. (ca. 1916)^#^ - Postcard view showing tour buses at the front entrance to Universal City, possibly the precursor to today's tram ride. (ca. 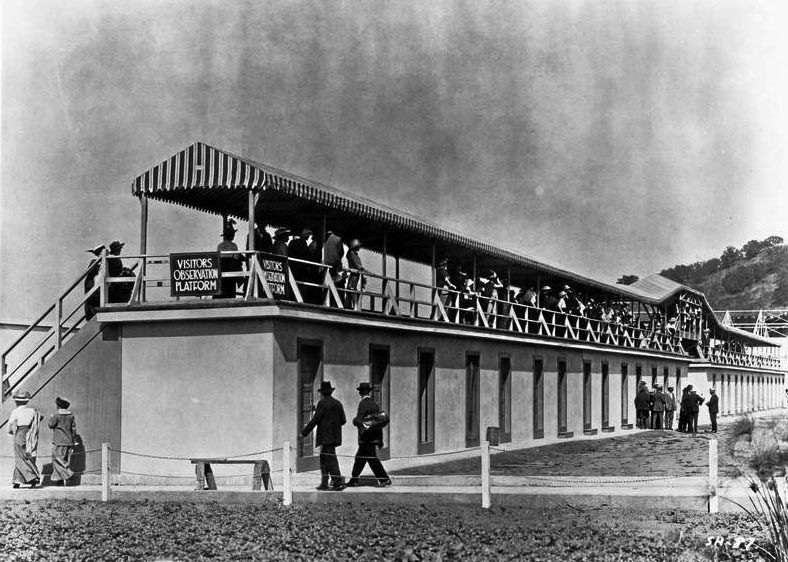 1916)**^# - View showing the visitors observation platform where guests could watch the filming of a movie. (ca. 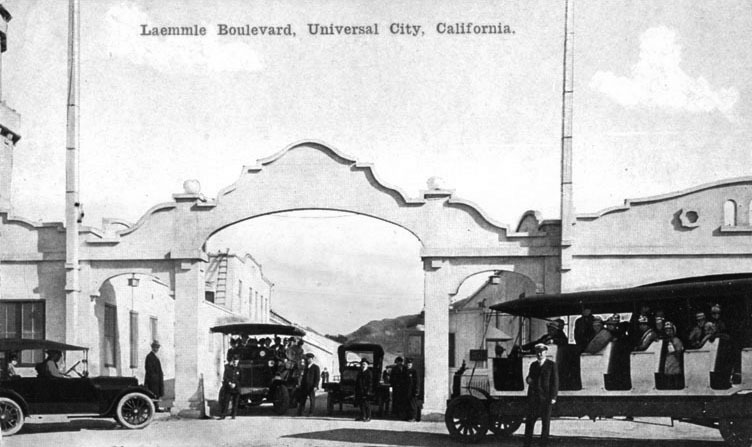 1915)^^ - View showing the filming a western movie on the Front Lot Stage at Universal City. 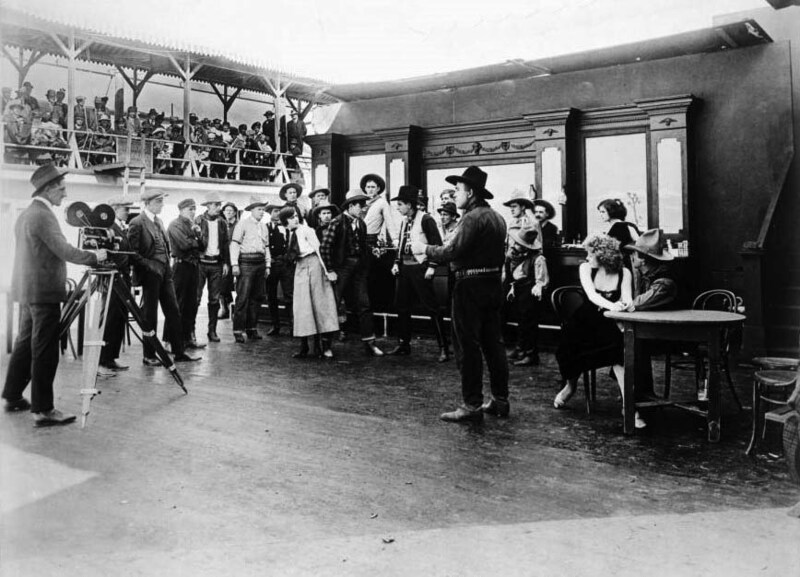 A bar scene can be seen at center, and several men and women are visible in western clothing. A man and a woman are seated at a table in the foreground at right. At left, the director and cameraman can be seen, along with several other assistants. People can be seen sitting on a high balcony at left, in an area labeled "Visitor's Observatory". During that time, Universal developed into a powerhouse studio, producing numerous classics such as All Quiet on the Western Front, Dracula, and Frankenstein. 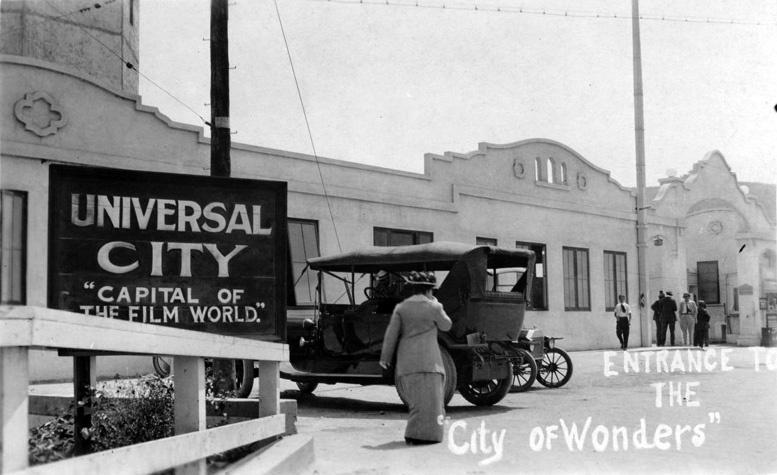 With its success, Universal City (and other San Fernando Valley studios) influenced the residential and commercial development of nearby North Hollywood, Studio City and Toluca Lake that took off in the 1920s. 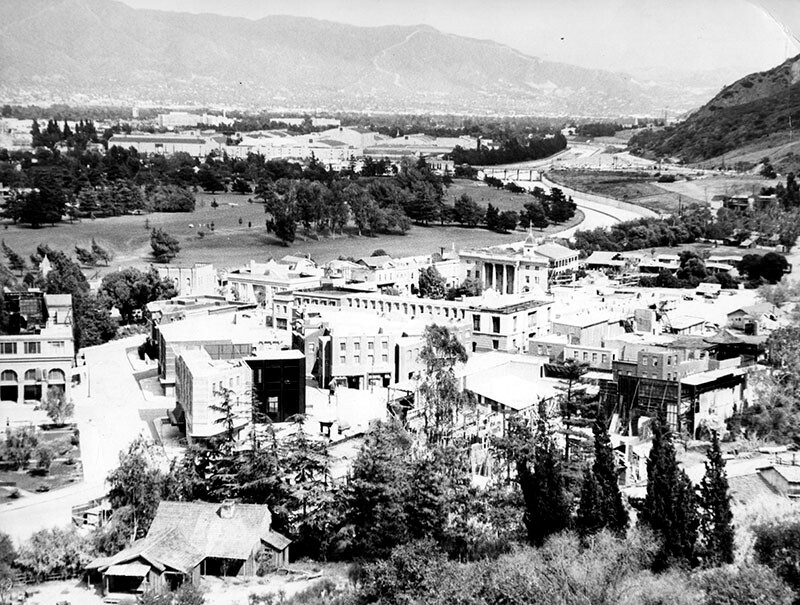 (1963)* – Panoramic view showing the 300-acre back lot of Universal Pictures, which includes four separate Western towns, three lakes, and sets used for films like "Psycho" and "All Quiet on the Western Front." 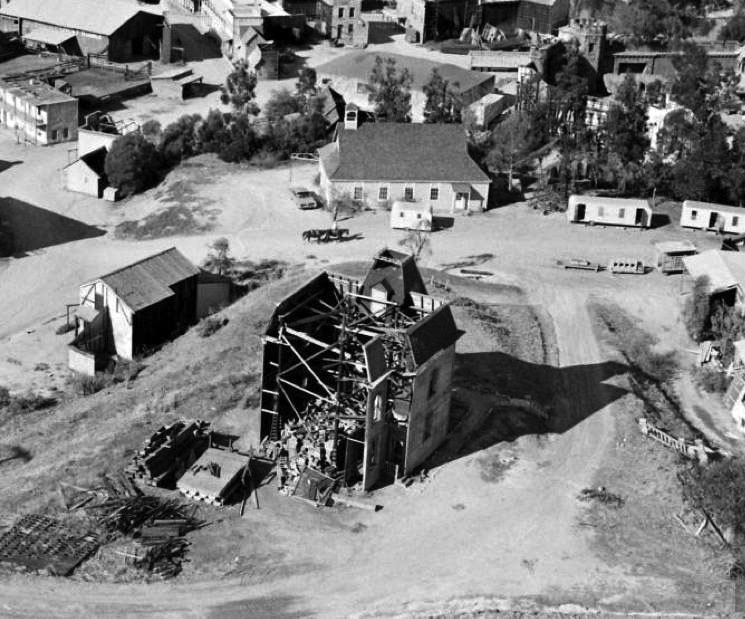 (1963)^x^ - Life Magazine photo showing the back of the courthouse on the lot that would be famous as downtown Hill Valley in the Back to the Future 20 years later. 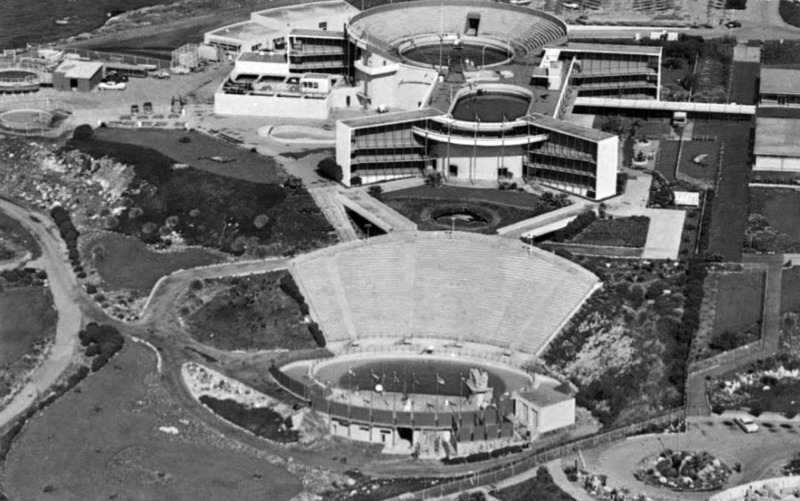 (1963)++# – Aerial view showing the rear view of Psycho House at Universal Studios. The Psycho House (Bates Mansion) was one of the big draws of the Universal Tram Tour, back in 1964, and has continued to be instantly recognizable in recent years. (ca. 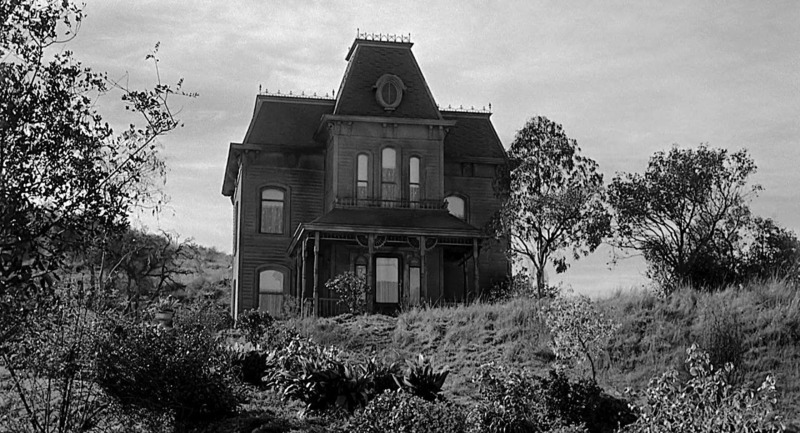 1964)++# - Still from movie showing front of the Psycho House. 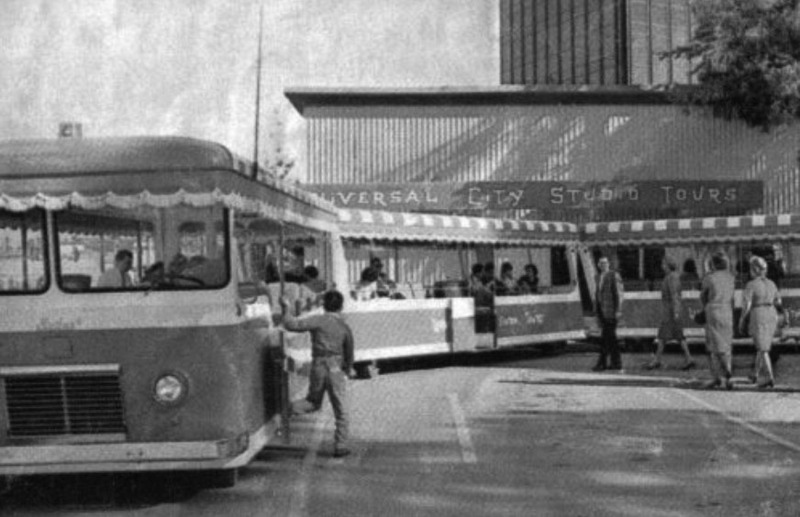 (1964)***# – Postcard view showing the Universal Studios Tour Tram as it appeared in its first year of operations. 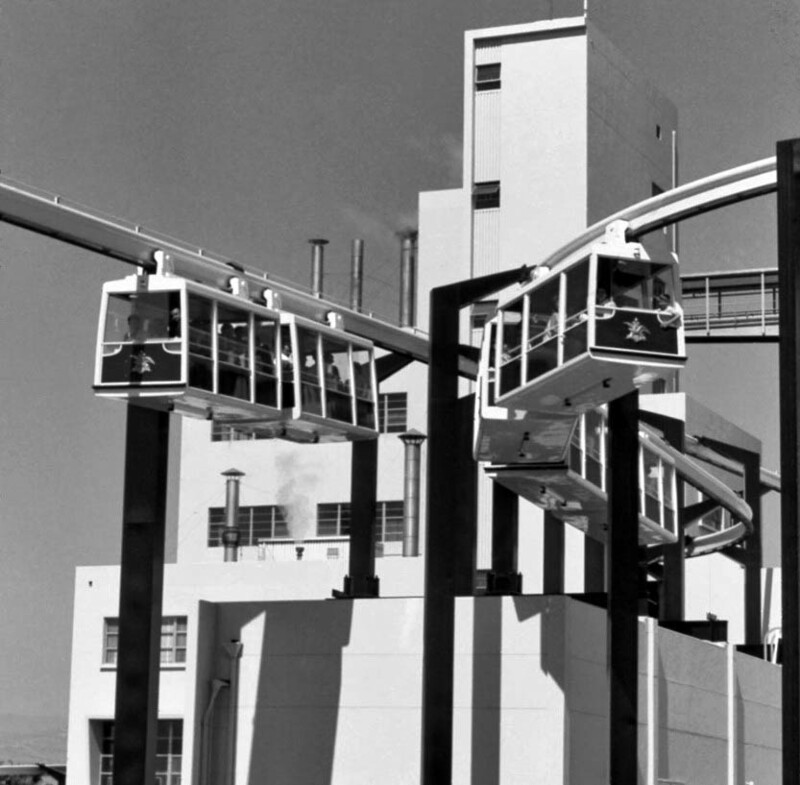 (1970s)* - A tour tram moves through the back-lot western sets of Universal Studios. 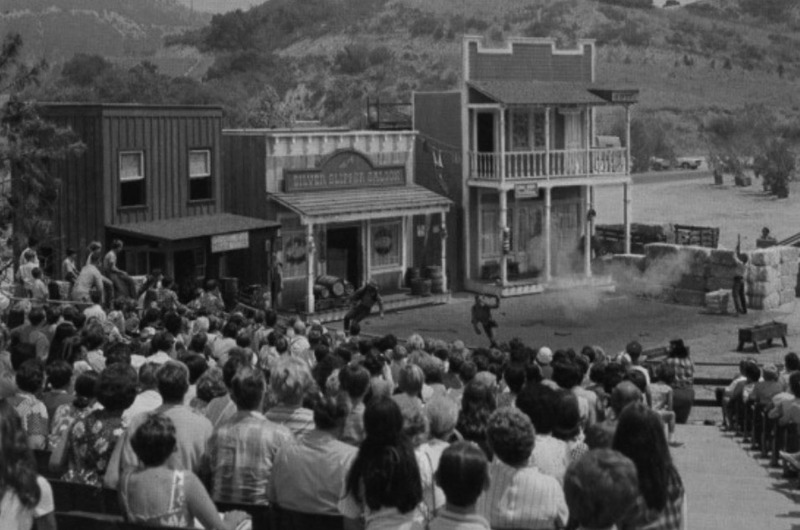 (1967)***# – Postcard view showing the original Wild Wild West Stunt Show at Universal Studios. (ca. 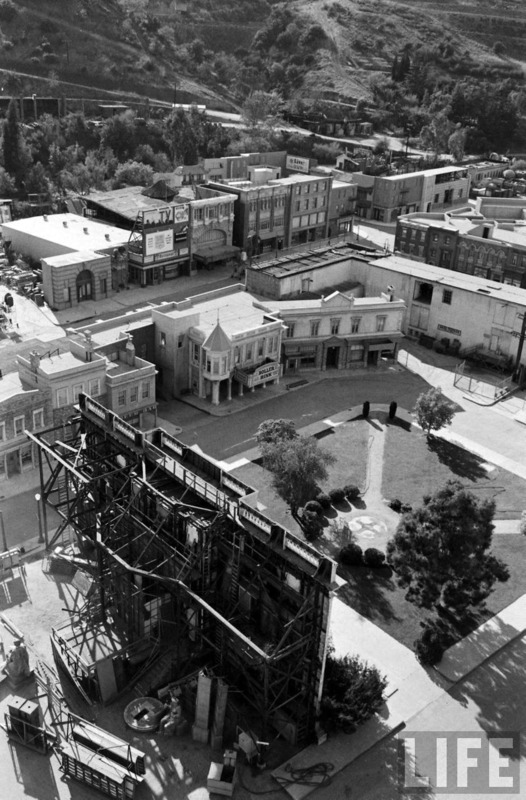 1970s)* - View of a film set on the lot of Universal City Studios. 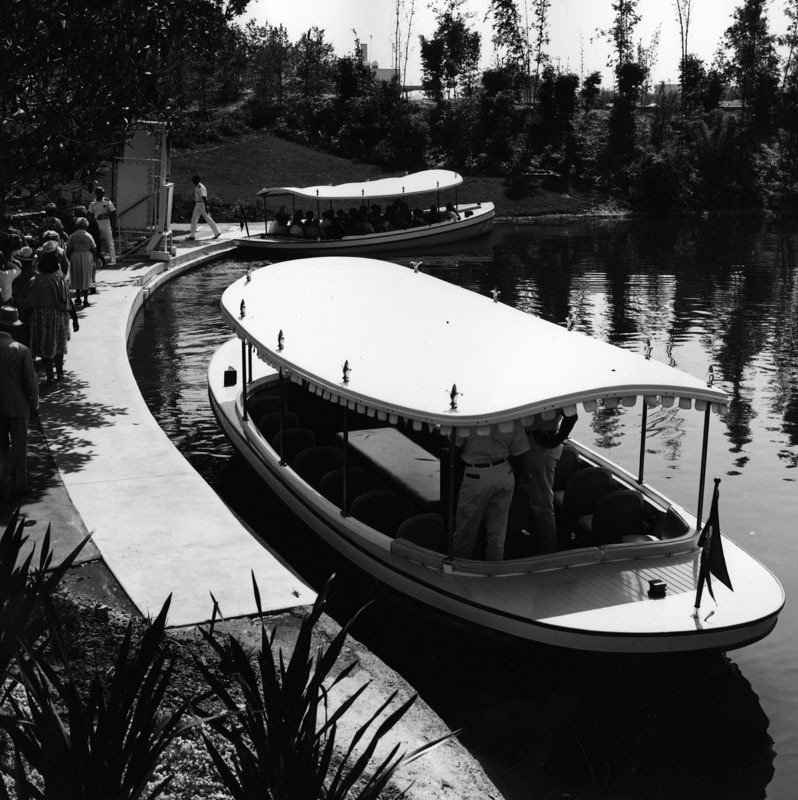 The Glamor Tram passes by Singapore Lake, one of the several man-made lakes on Universal's 410-acre lot. In the background looms Alfred Hitchcock's "Psycho" house. 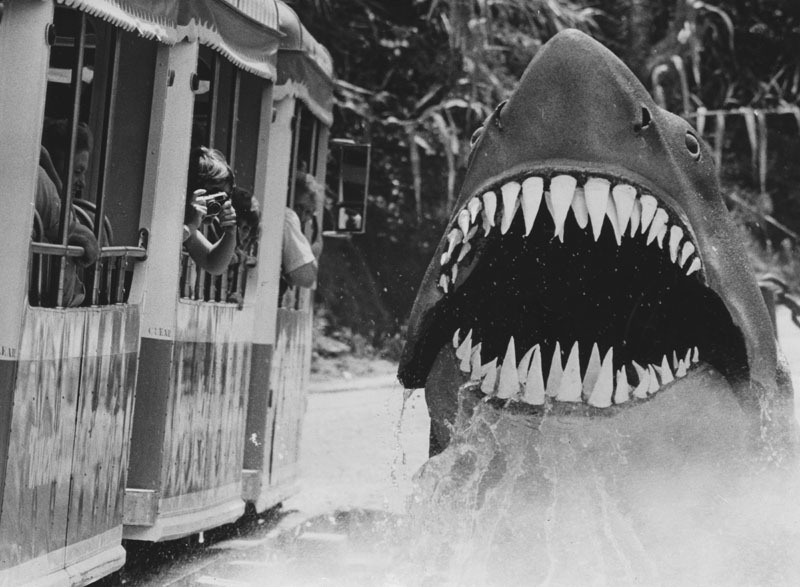 (1979)* - Tram riders experience an encounter with JAWS in one of the Universal Studios' back-lot lagoons. 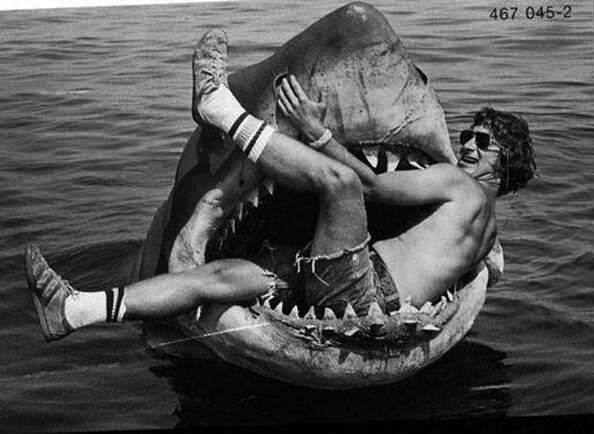 (1975)*## - Steven Spielberg plays with the robot shark on the set of Jaws. The movie Jaws was directed by Steven Spielberg and based on Peter Benchley's novel of the same name. It was the highest-grossing film in history at the time, and was the most successful motion picture of all time until Star Wars. (1986)* - An up close and personal encounter with King Kong. Opened on June 20, 1986. 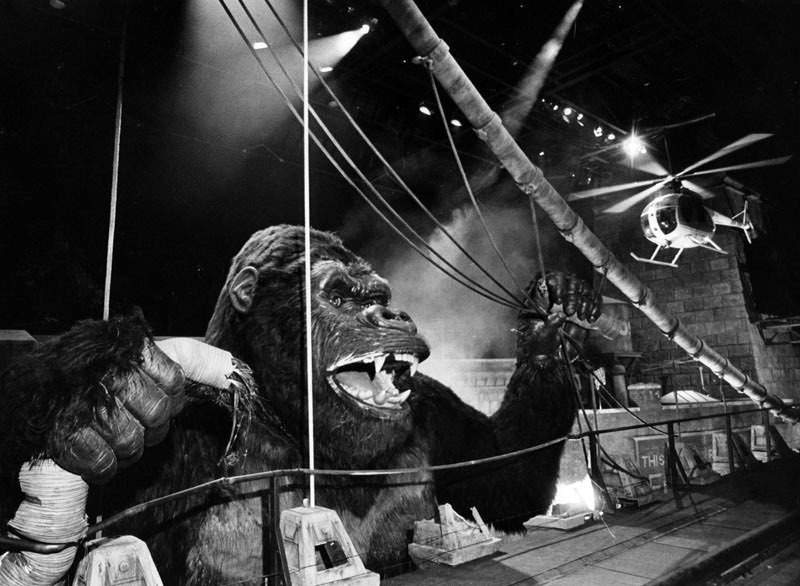 The show began as the tour tram entered the soundstage and stopped in front of an apartment building facade where guests watched a breaking news report about Kong's rampage on television monitors located inside of the building's windows. A news chopper circling overhead was covering the story when Kong suddenly swatted at the chopper, causing it to come crashing down from above and exploding only a few feet away from the tram. As the tram rounded a corner, it drove out onto the Brooklyn Bridge, putting guests at eye-level with the giant animatronic ape. The enraged Kong shook the bridge and ripped the suspension bridge cables apart in an attempt to grab the tram. But guests managed to narrowly escape the clutches of Kong as the tram exited the soundstage just in the nick of time. 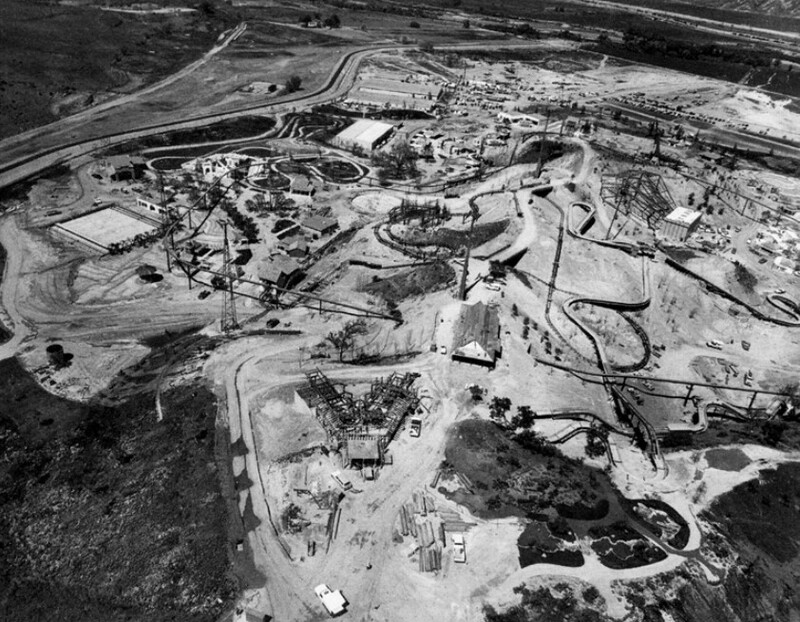 (1970)#^* - Aerial view looking northeast showing Magic Mountain under construction. The Y-shaped structure in the foreground is the Magic Pagoda; down and to the right of it is the footing for the Sky Tower, which has not yet been erected. 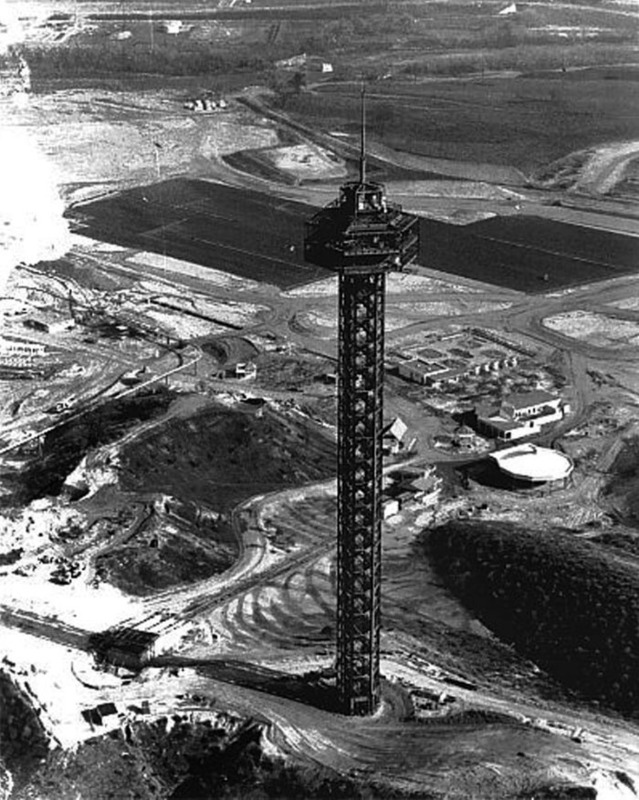 (1970)#^* – View of the newly erected Magic Mountain Sky Tower overlooking the not-yet-opened park and other parts of Valencia from a height of 384 feet. 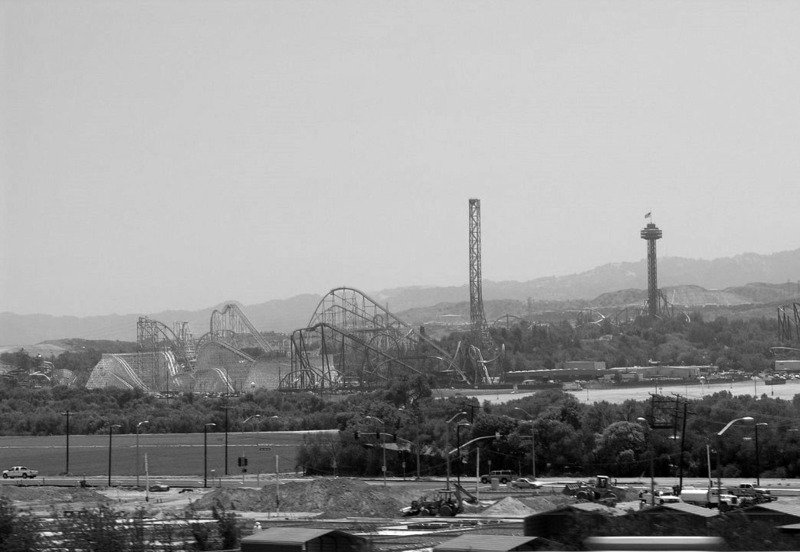 (n.d.)^ - Magic Mountain as seen from the Golden State Freeway. 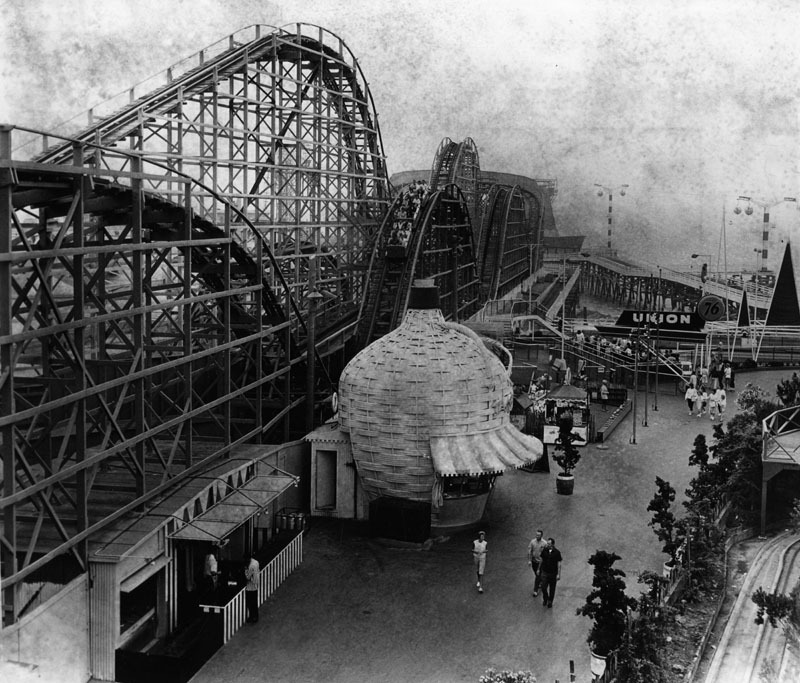 (1978)^*^# - View of the Colossus Roller Coaster on its opening day. (ca. 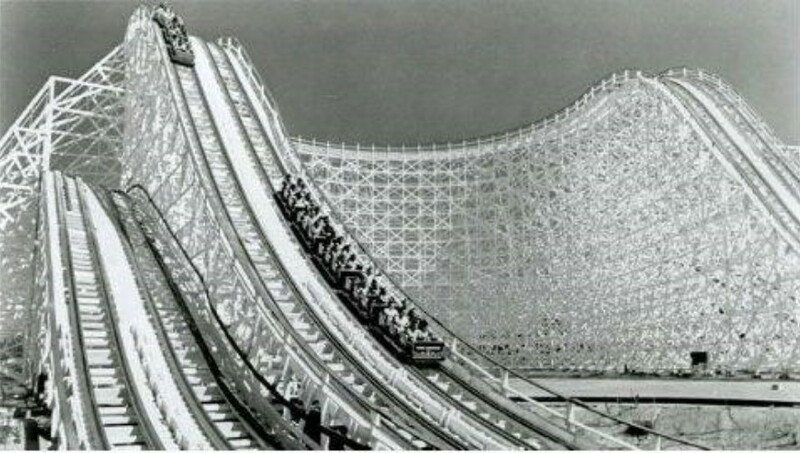 1978)*^*# – View of the Colossus at Magic Mountain, showing two roller coasters streaming down the dual parallel tracks. (ca. 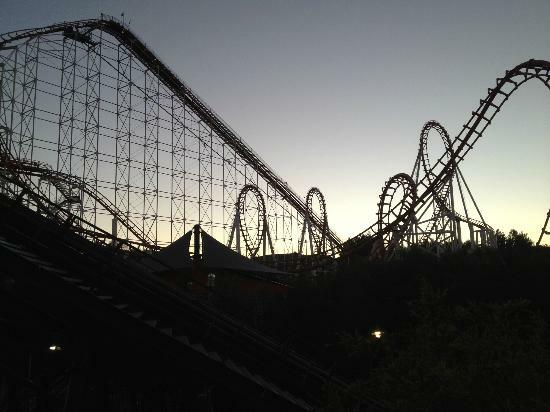 2000) - Silhouette view of Magic Mountain at dusk. 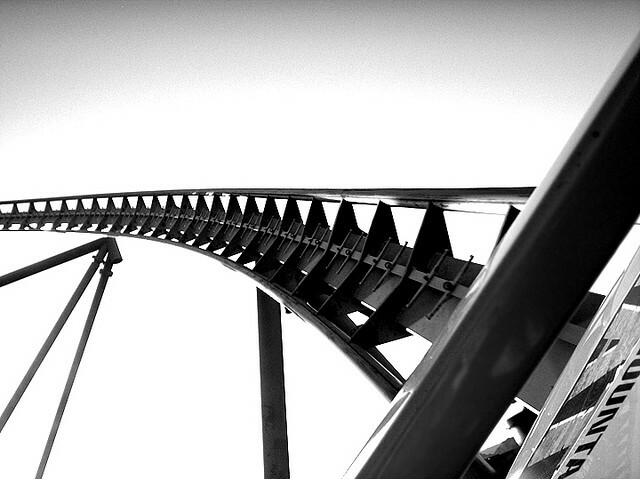 (2007)** - Magic Mountain roller coaster.